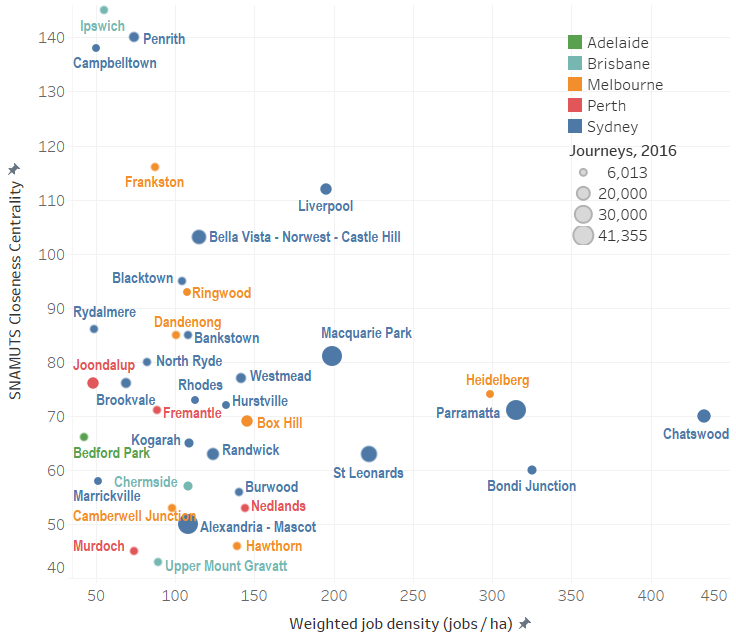 Which Australian city is sprawling the most? 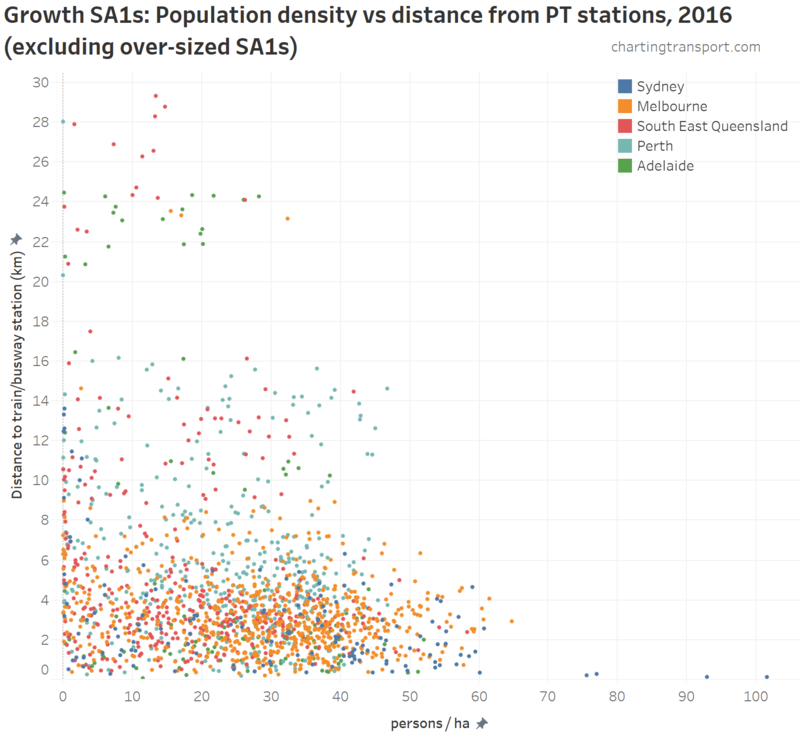 For a while now, I’ve been tracking urban sprawl and consolidation in Melbourne, but some interesting recent research prompted me to compare Melbourne to the other large Australian cities. 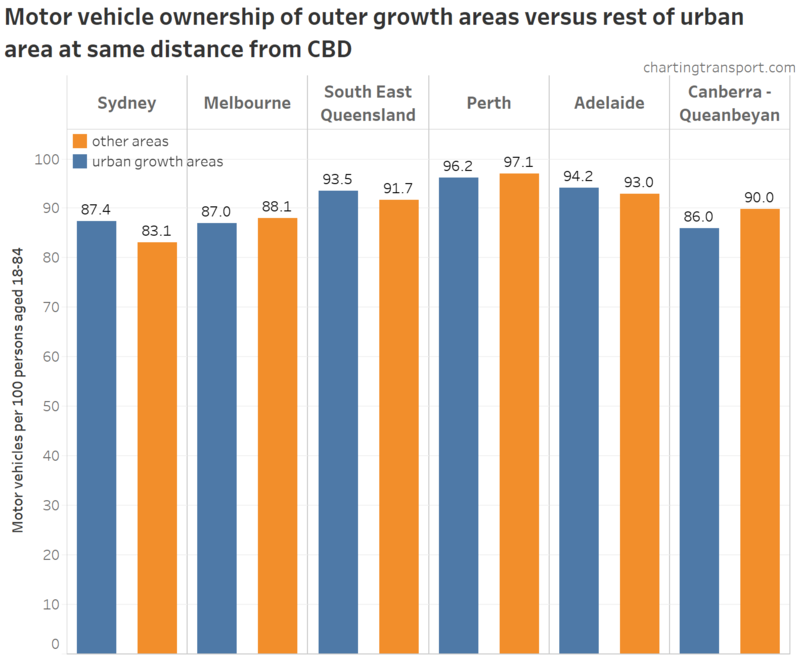 Firstly, I need to define “outer” growth. 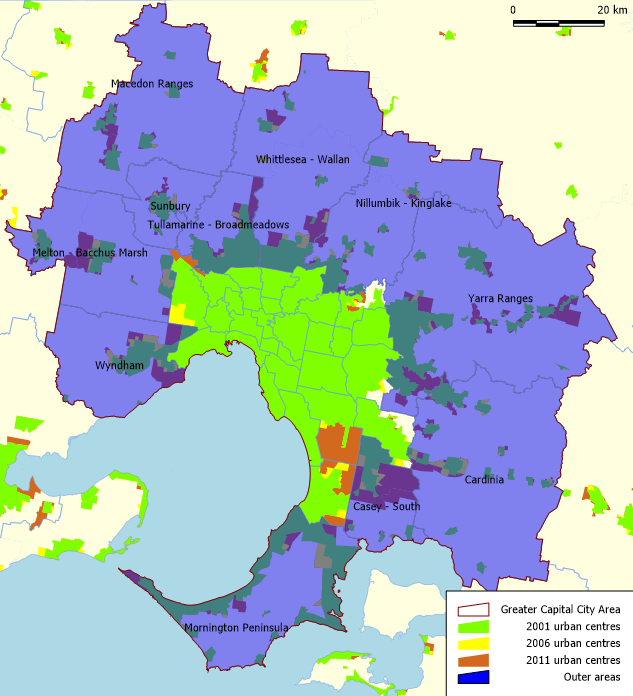 To do this, I’ve mapped the 2001, 2006, and 2011 ABS urban centre boundaries of each city. 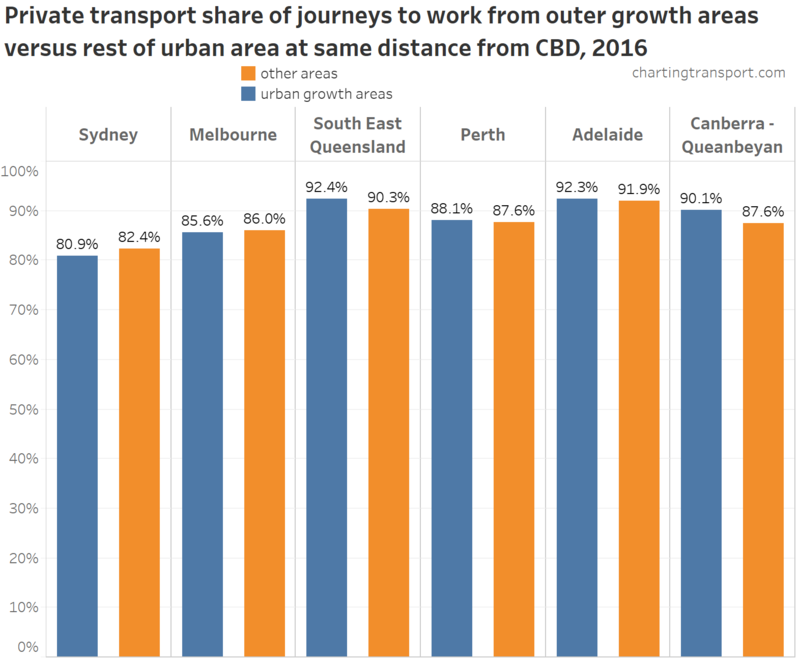 I’ve then looked at Statistical Area 3 regions within each Greater Capital City area that either saw substantial urban growth between 2001 and 2011, or were located on the fringe of the main urban area. 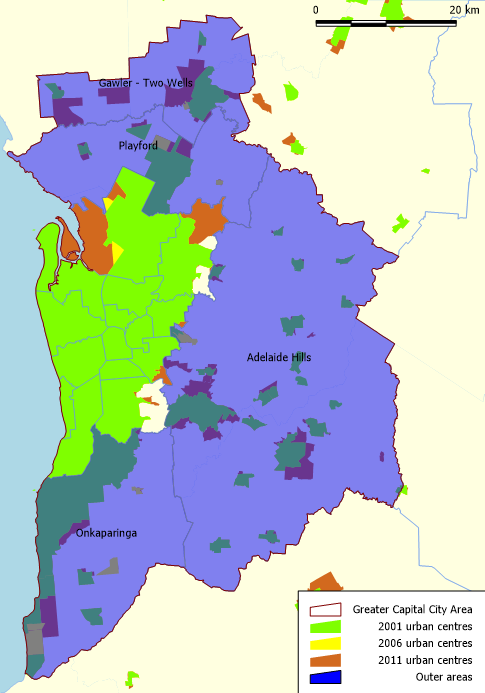 The area in the middle is mostly shaded green – land considered by the ABS to be urban since at least 2001. There are a few yellow and orange areas (developed 2001-06 and 2006-11 respectively) that are not part the blue shaded “outer” area. 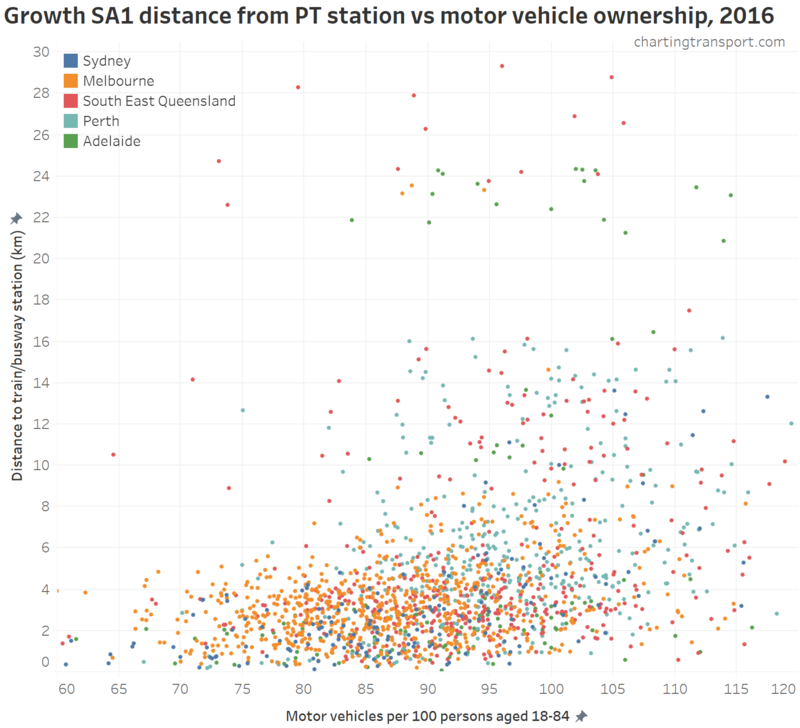 The larger orange section visible in the south is mostly green wedge or industrial land, so does not represent growth of residential areas (maps for other cities below). 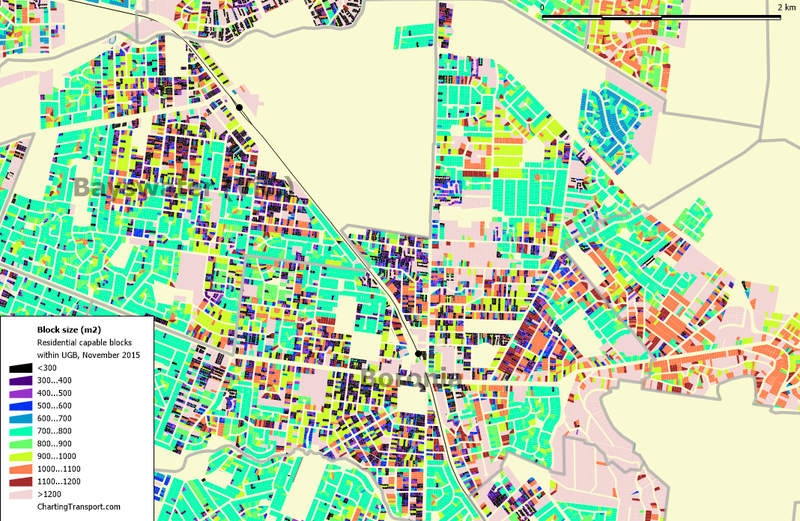 The other yellow and orange areas are relatively small, and many have non-residential land uses. 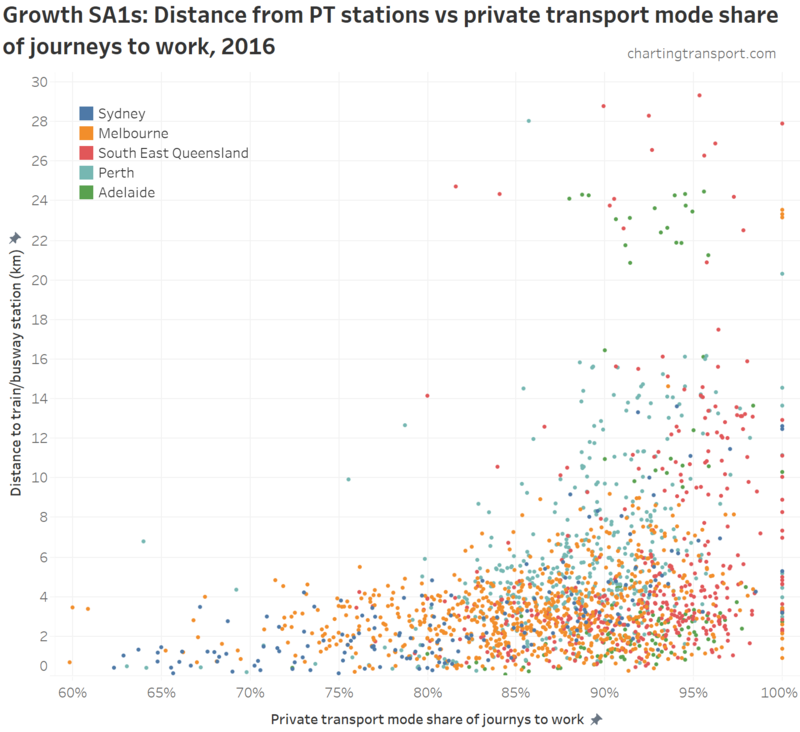 I’ve done a similar process for Sydney, Perth, Adelaide, and the conurbation of South East Queensland (ie Brisbane, Gold Coast, and Sunshine Coast combined). 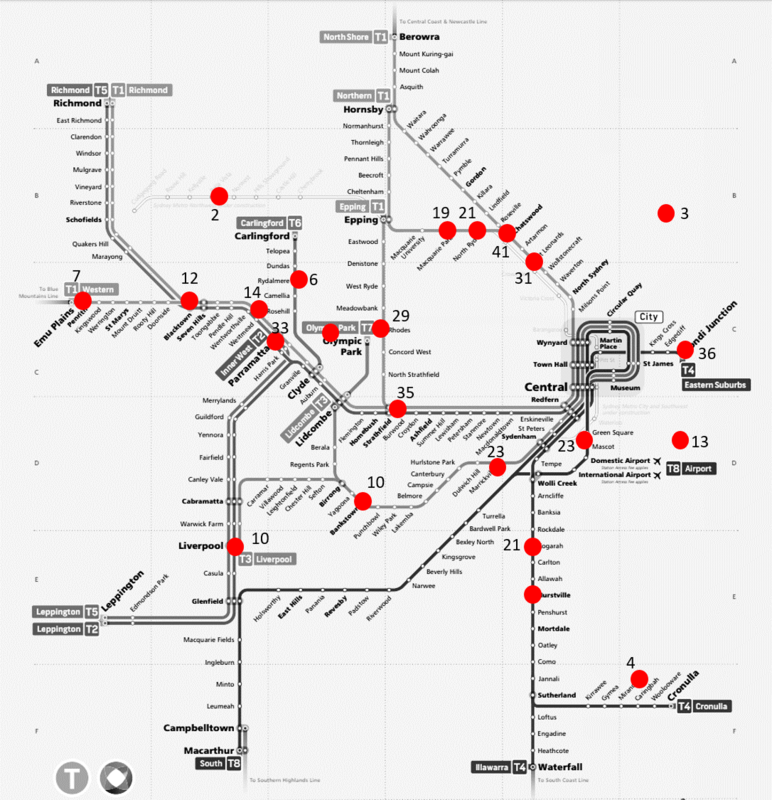 See the end of this post for equivalent maps of these cities. 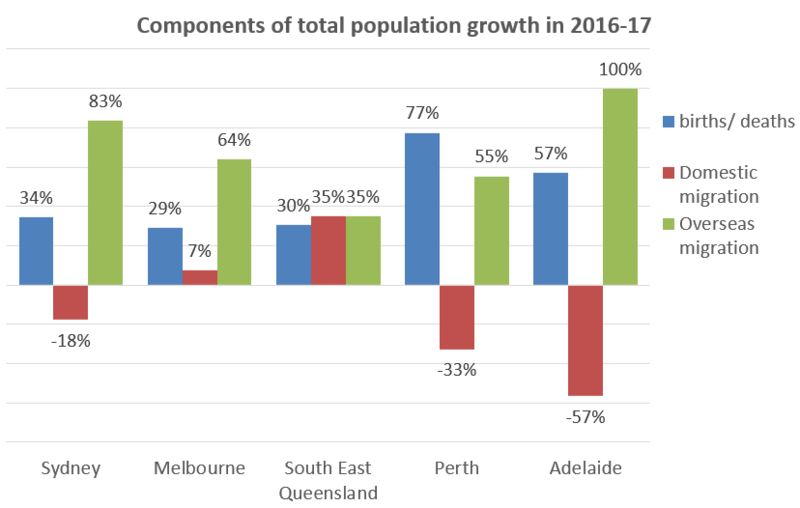 As you can see almost all population growth in Perth is happening in the outer suburbs (in fact there was population decline in the rest of Perth in 2016-2016), while almost half in Melbourne and South East Queensland, 29% in Sydney and 40% in Adelaide. 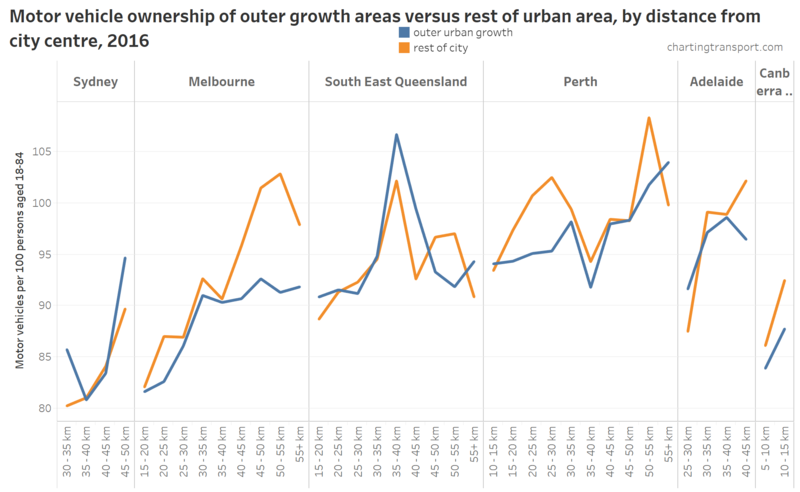 Perth saw dramatic growth between 2007 and 2013, but much less growth in the last few years, but most of that happening in outer areas. 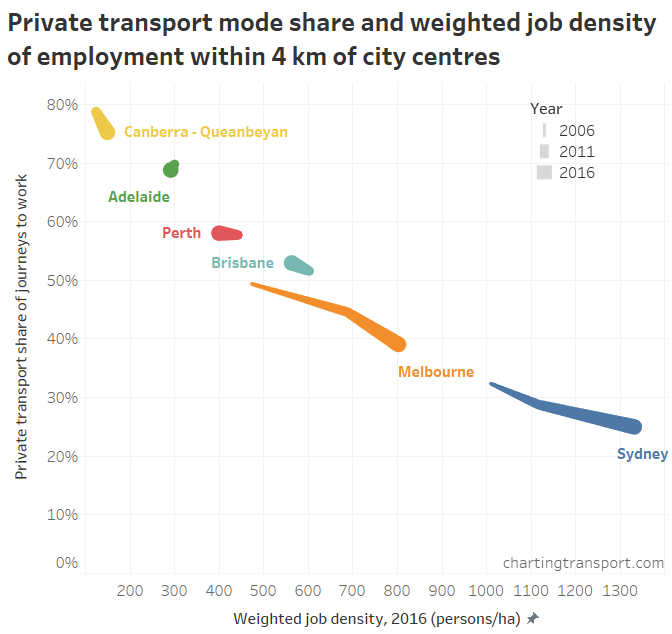 In recent years Melbourne has grown the fastest. 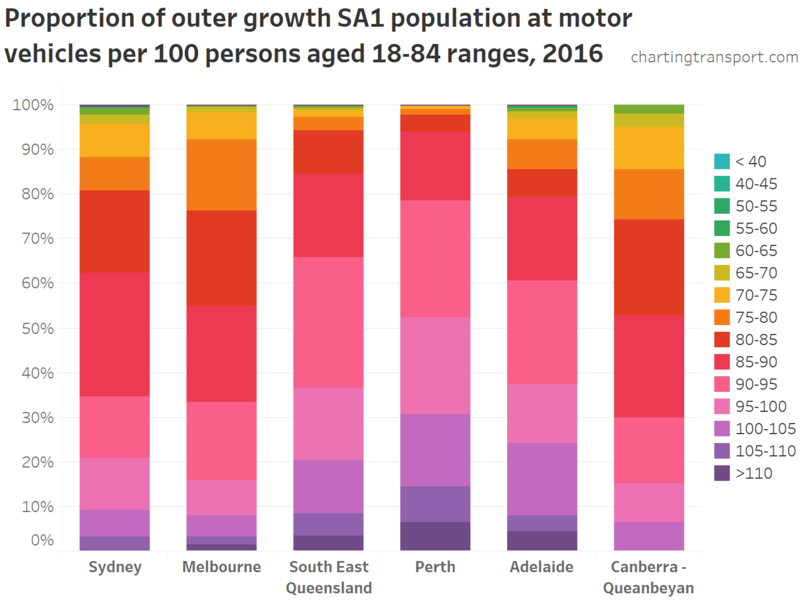 The SA3 population data goes back to 1991, which creates some interesting results in the early nineties (even though my defined “outer” areas are trying to measure growth from 2000 onwards). 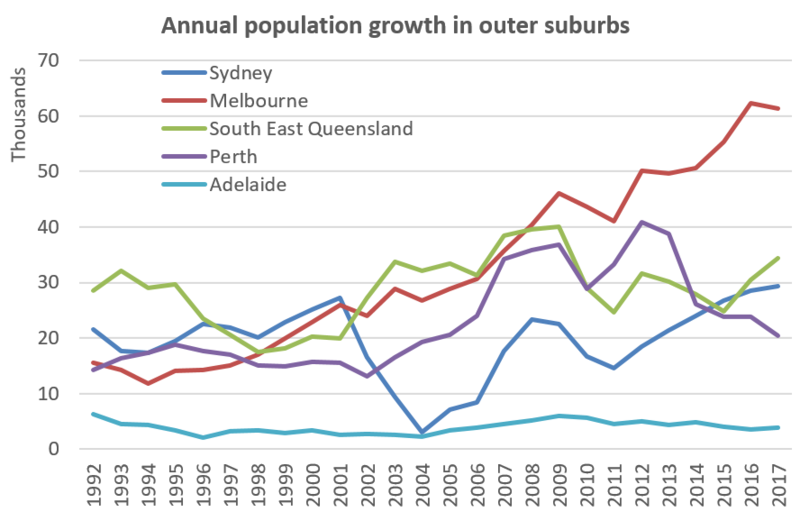 In Adelaide in 1993 the outer areas had “156%” of the city’s population growth – which actually means that the outer areas grew (by 4509 people) while the inner areas had population decline (by 1617 people). 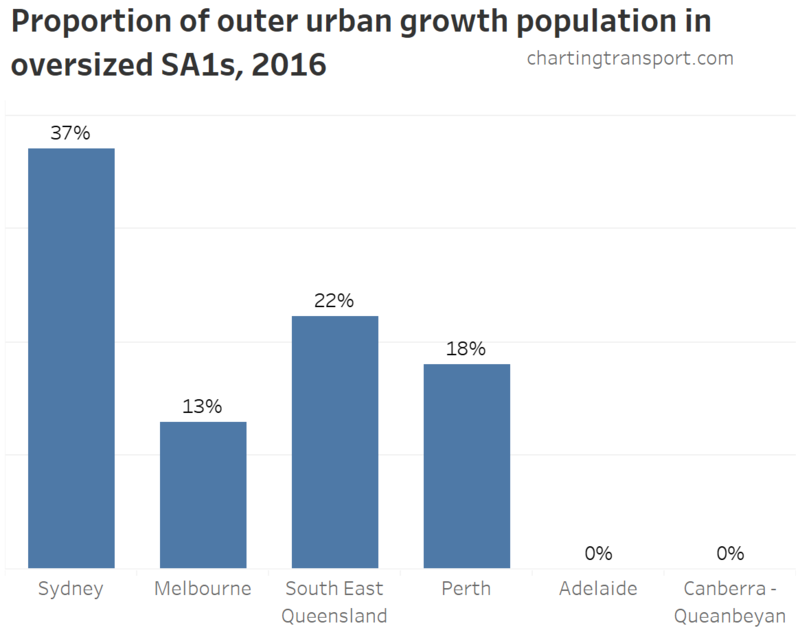 At the same time in Melbourne, “103%” of population growth occurred in the outer areas as there was a net reduction of 393 people in the inner areas of Melbourne. 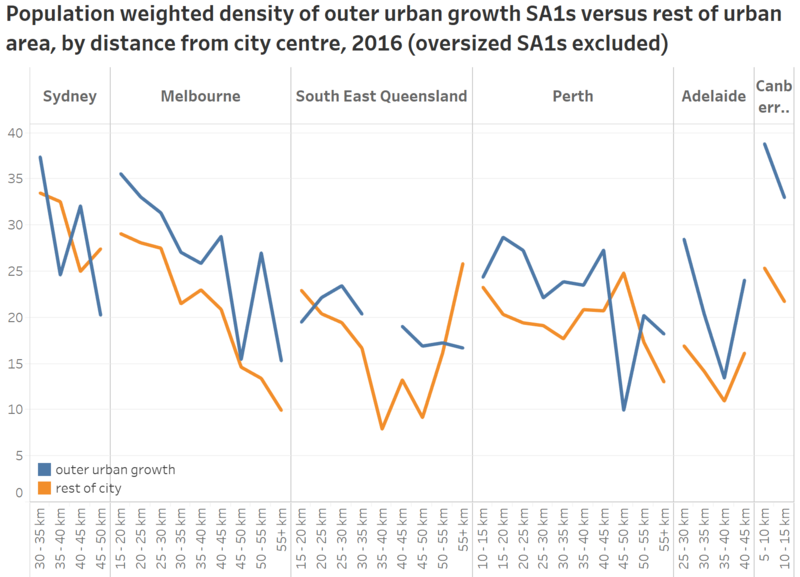 But an emerging new trend is that Perth’s weighted population density (at least when measured at SA3 geography) peaked in 2013 and has been declining since. 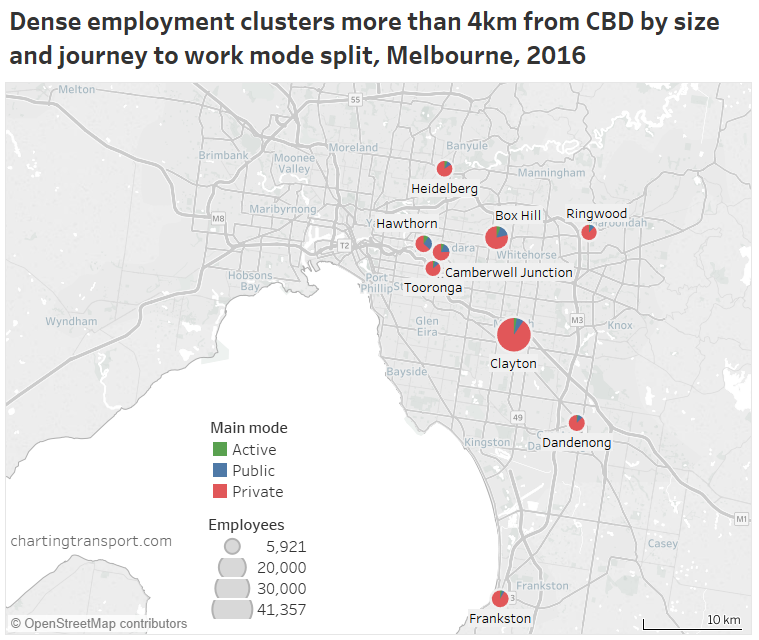 On my definitions of outer areas, Melbourne is charging ahead, with over 61,000 residents moving into growth areas in 2016-17. 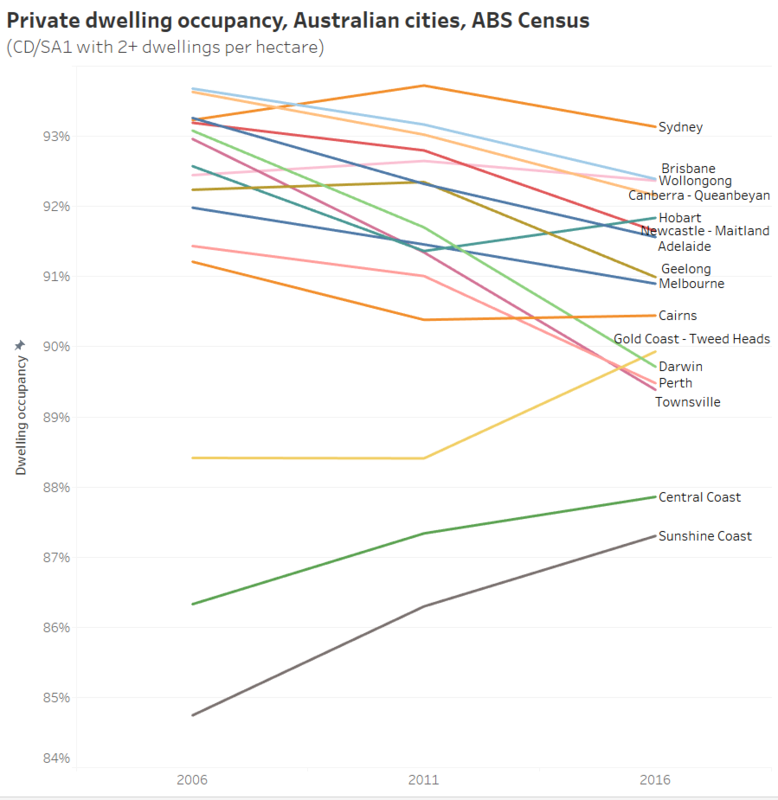 Perth peaked in 2012, but has fallen back since. 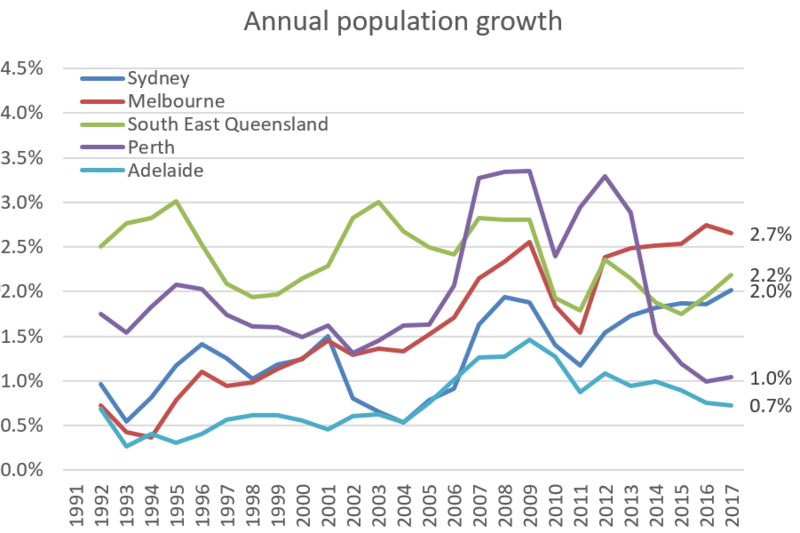 Adelaide just hasn’t seen a lot of population growth in recent decades. 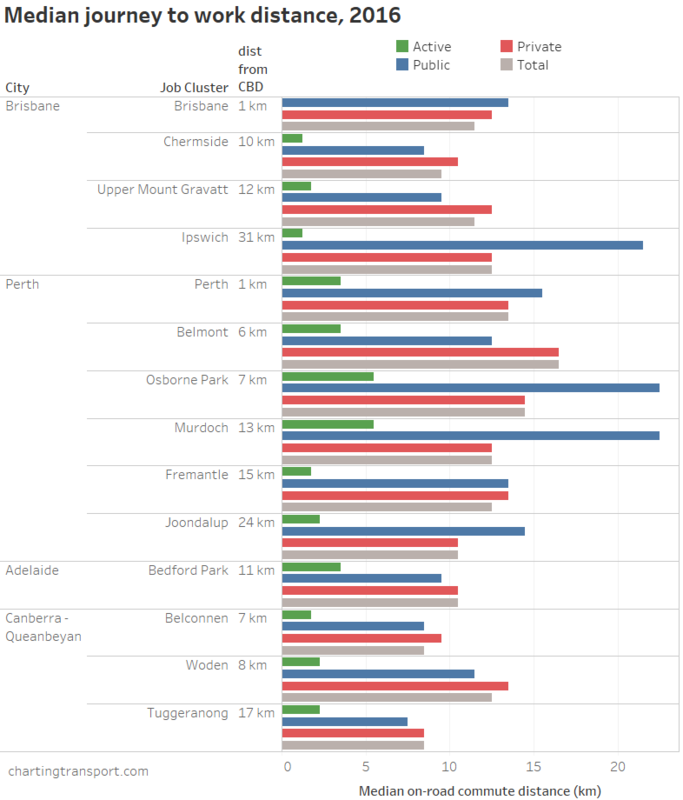 I’m measuring sprawl by population, but you could argue that it might be better measured by urbanised area. I’ll have to look at that in another post. 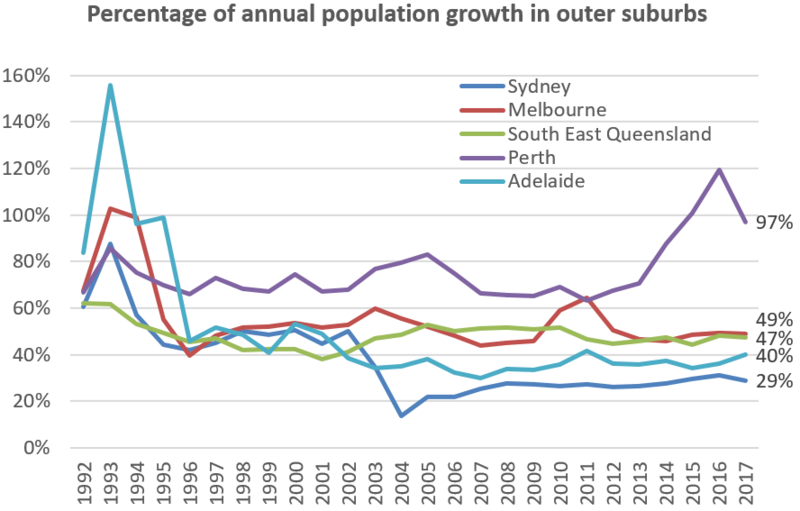 Population growth in outer Sydney slowed dramatically between 2002 and 2006. The chart below shows there was also a slow down in non-outer areas, although it was a little less dramatic. 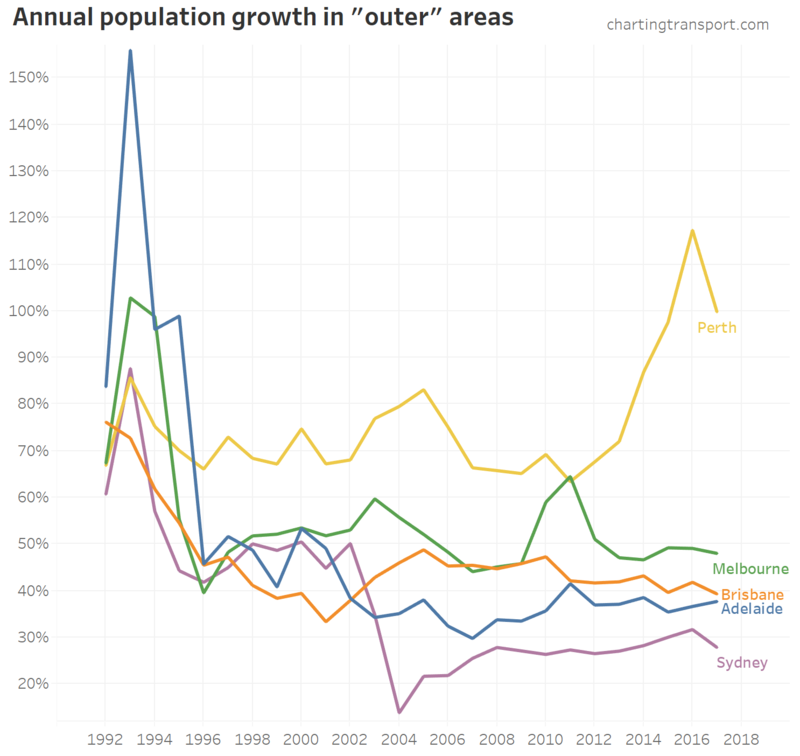 Around this time Sydney also transitioned from around 50% of growth being in outer areas, down to around 30%. 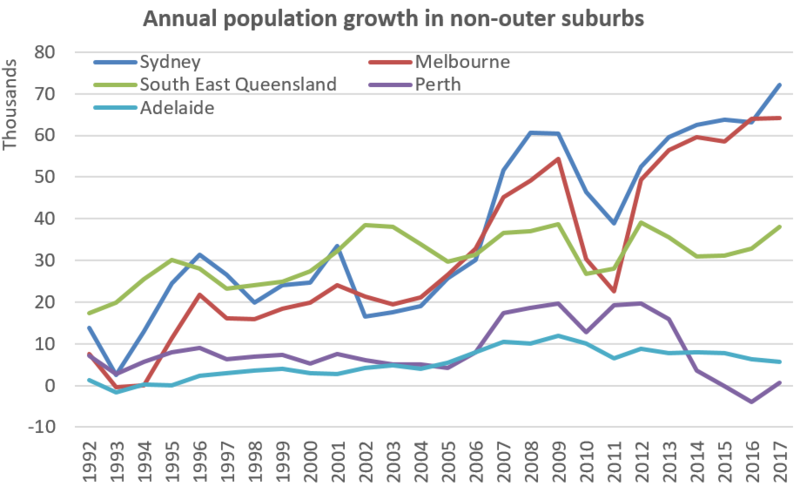 Around 2007 there was an acceleration of population growth in non-outer areas in most cities (although there was a subsequent lull around 2010-2012). 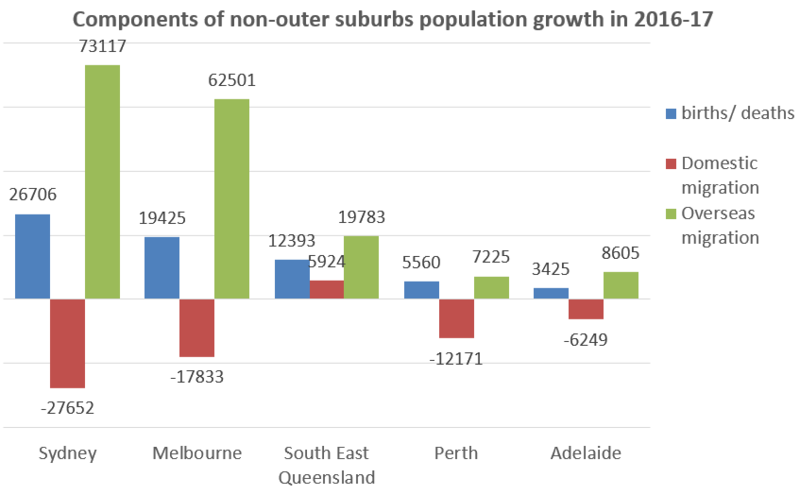 In 2015-16 in Perth, the population of the non-outer areas decreased by an estimated 3867 people. 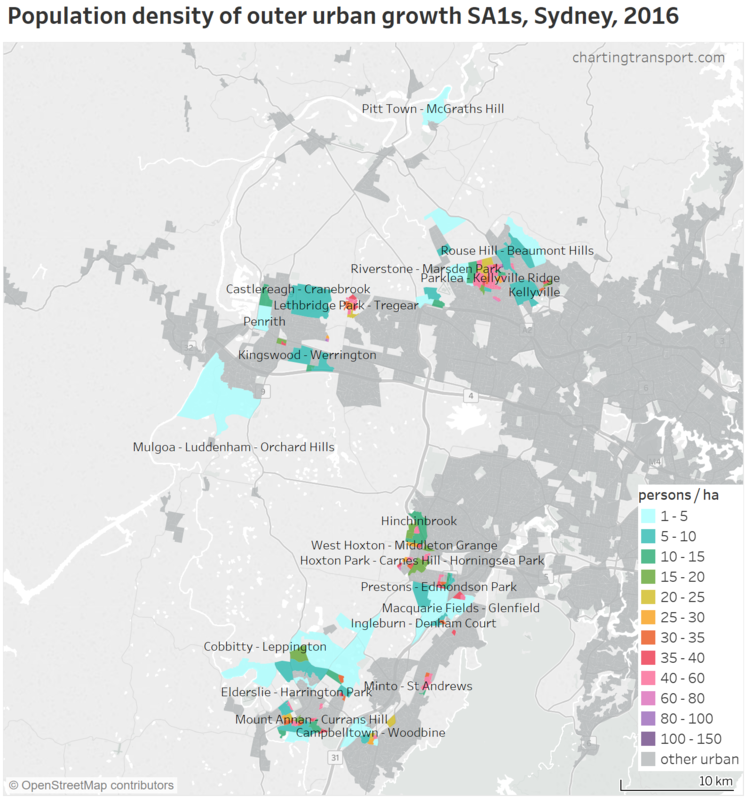 The outer areas will have some combination of urban growth and urban densification. 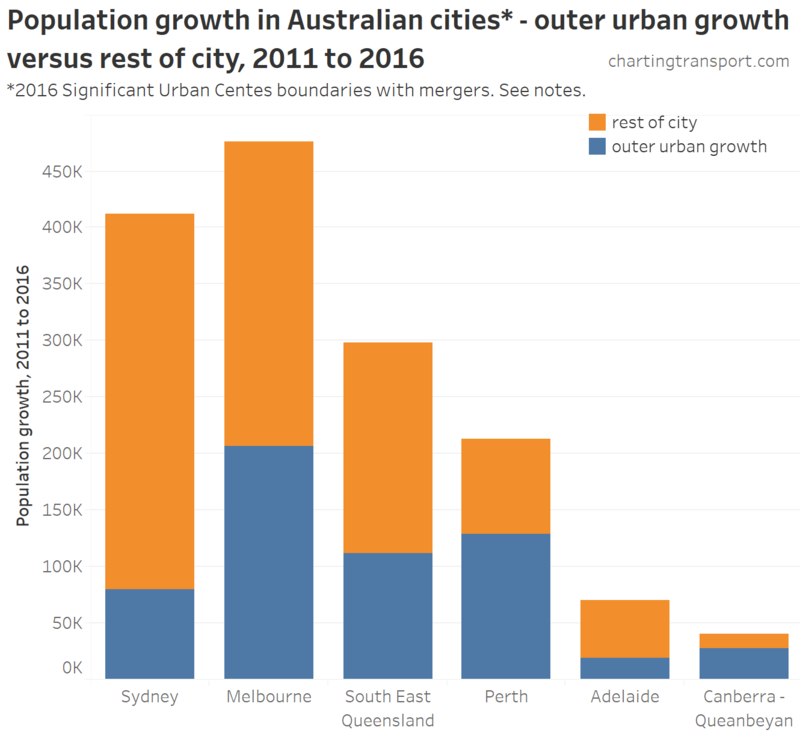 My guess is that most population growth will be from urban sprawl, as urban consolidation is more likely to happen in the inner and middle suburbs. 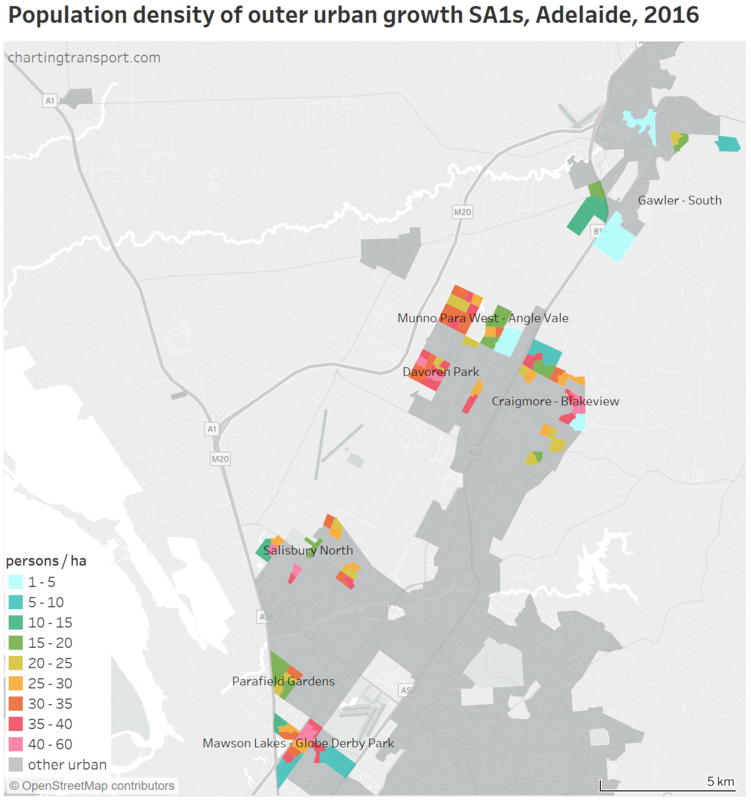 But my method doesn’t attempt to remove urban consolidation in outer areas. 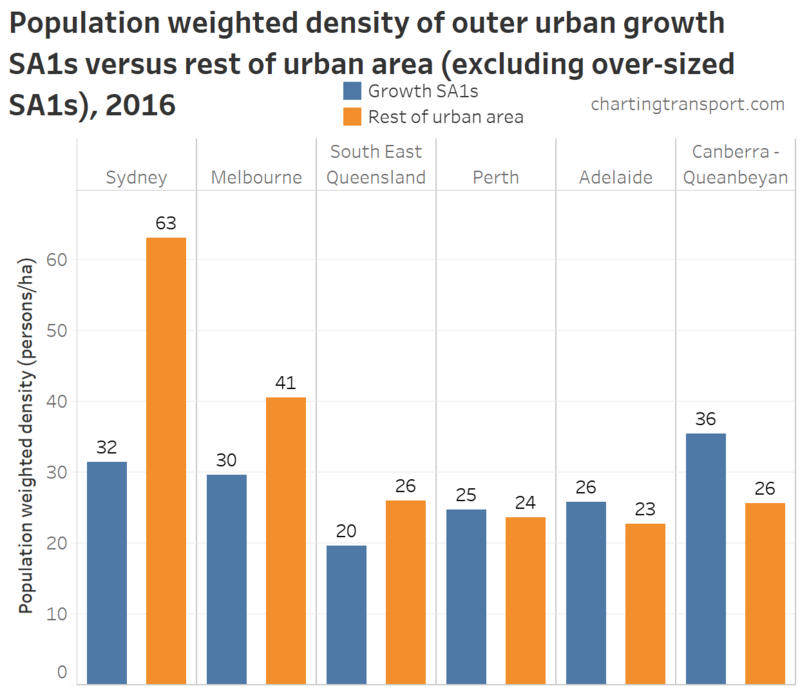 You might be wondering about the inclusion of outer areas that are not experiencing urban growth. 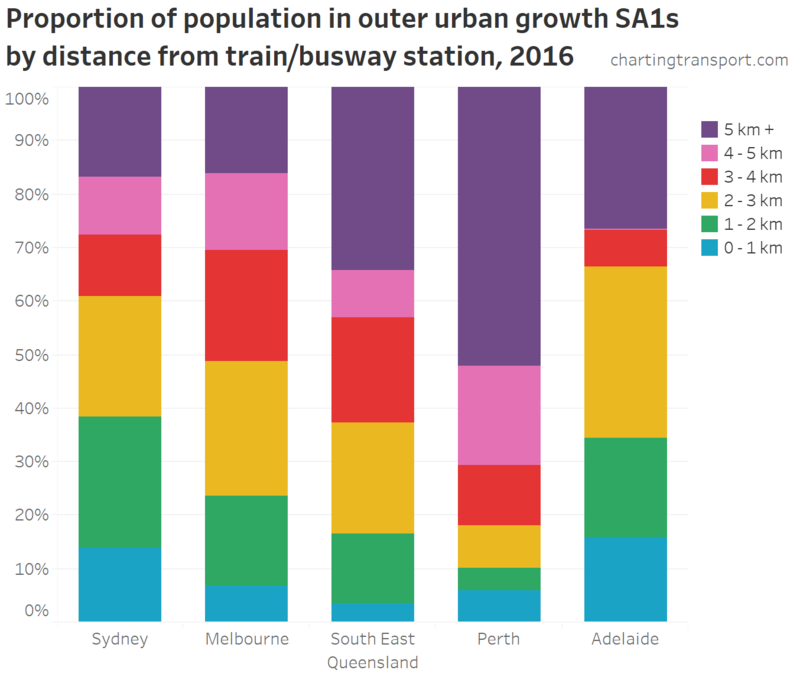 These areas are unlikely to have much population growth at all, so will have little impact on the calculations of percentage of growth in outer areas. 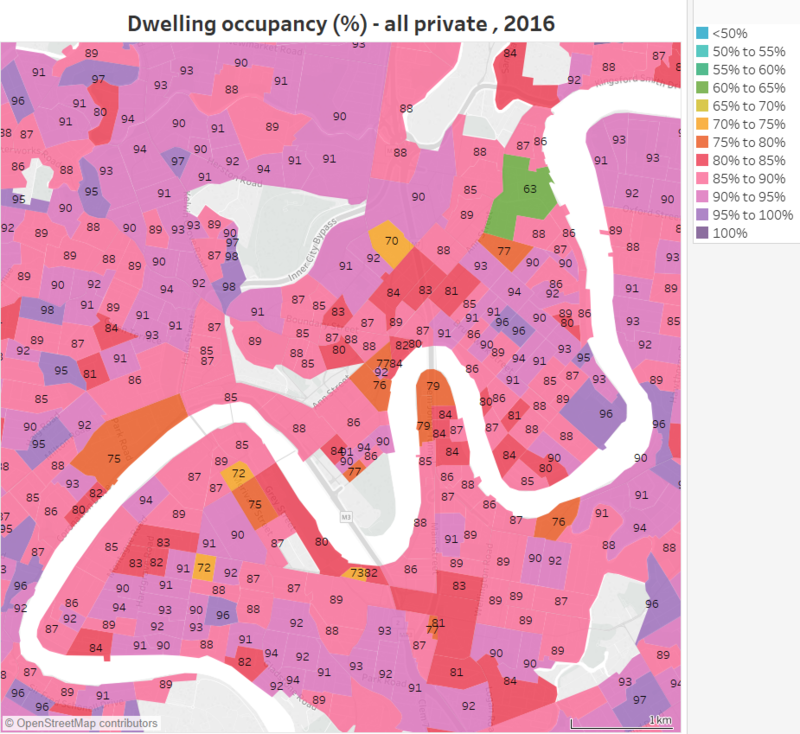 Where did the new residents come from? 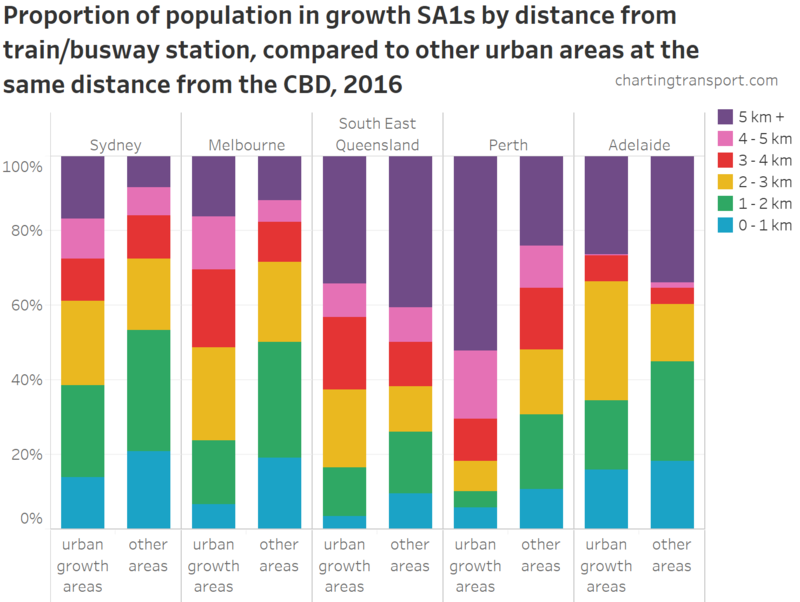 The ABS now publishes the components of population growth down to SA2 geography, so we can dig a little deeper. 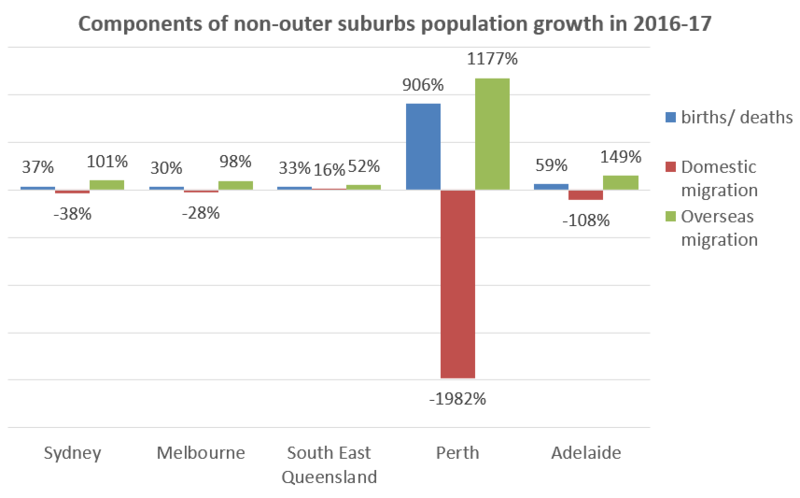 In Perth and Adelaide, less than half of the outer suburbs population growth was from new residents, whereas it was more like 72% in the other three urban centres. 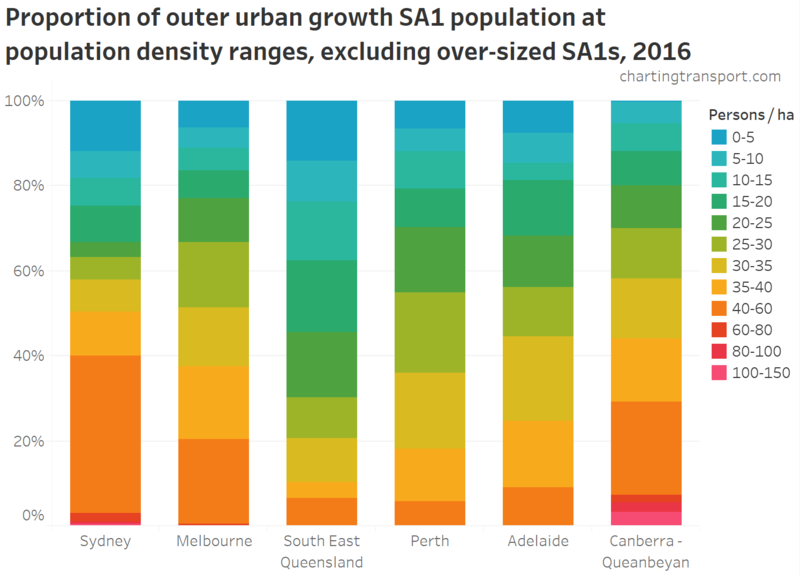 This might reflect relatively slower outer urban growth in Perth and Adelaide – with population growth coming more from existing residents growing families rather than new residents. 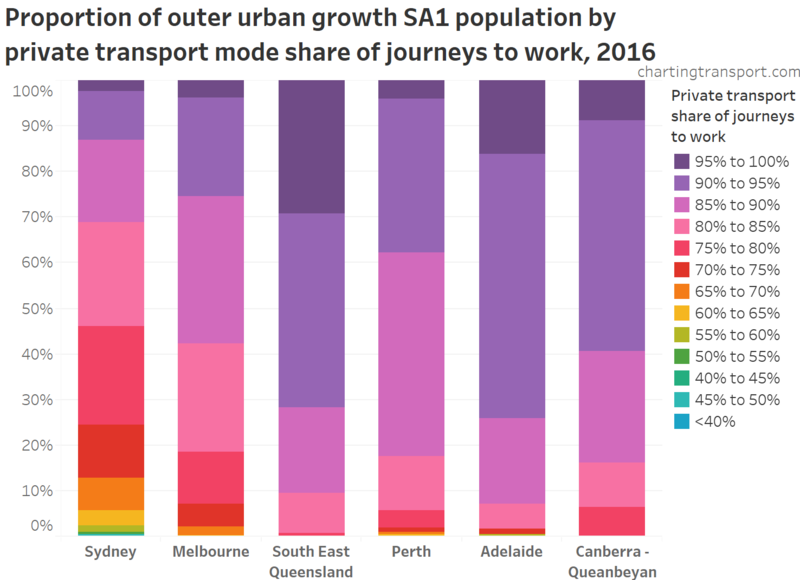 Sydney, Perth, and Adelaide have seen existing residents leave for other parts of Australia, replaced with babies and international migrants. 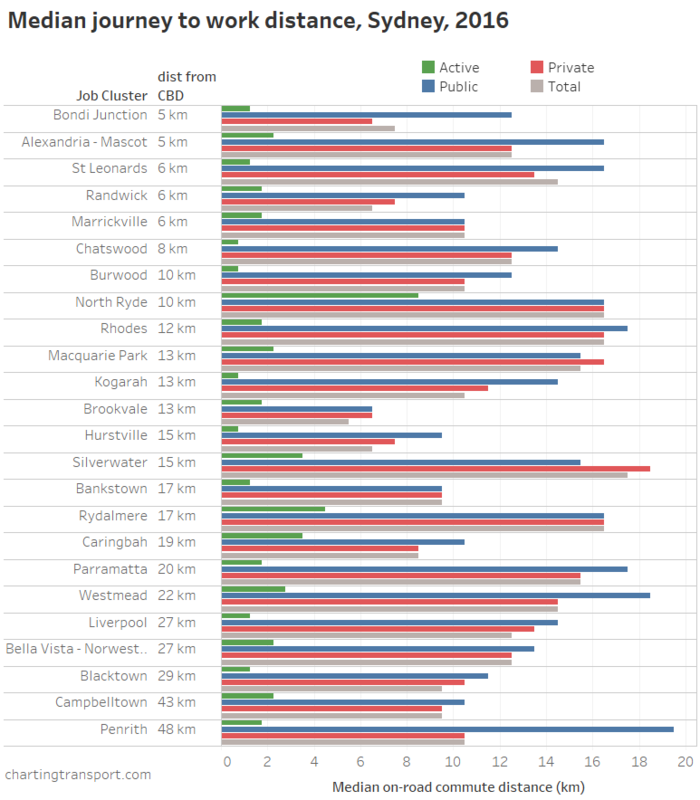 The three columns for each city do actually add to 100%. 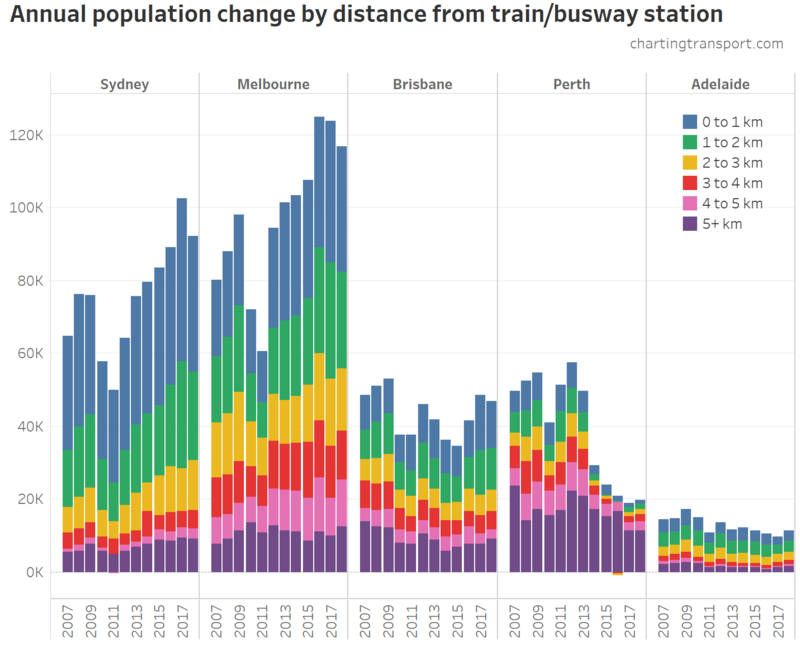 In Perth the net population increase was only +614 people, whereas there was a natural increase of 5560 (906% of 614), domestic migration to other places of 12171 (1982% of 614) and net 7225 international migrants (1177% of 614). 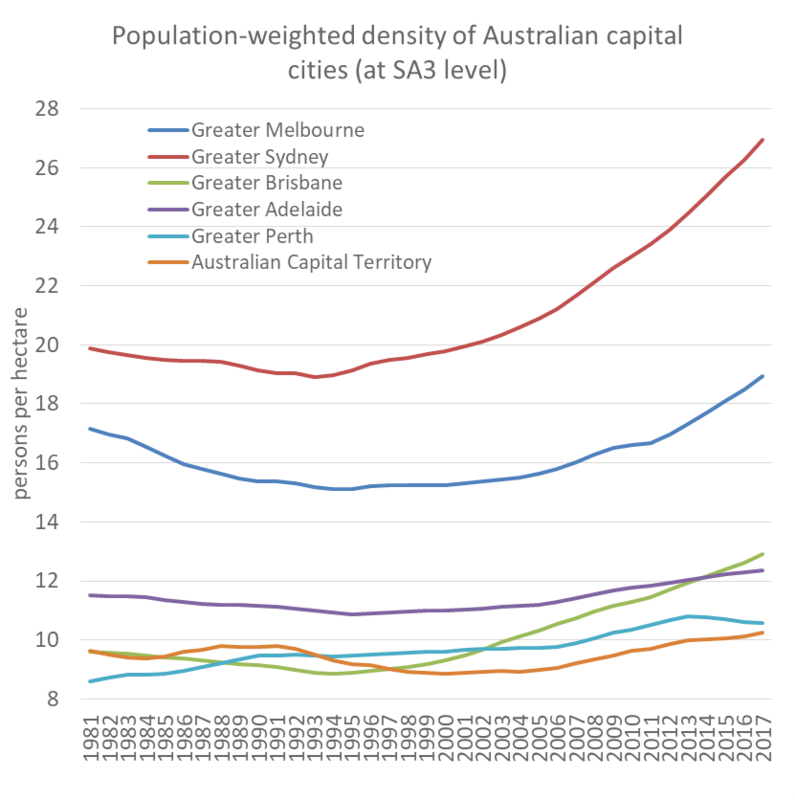 In Melbourne and Sydney, the net increase from births/deaths in non-outer areas was effectively cancelled out by people migrating away domestically (many likely to the outer suburbs of the same city), with the net population growth then mostly accounted for by net overseas immigration. 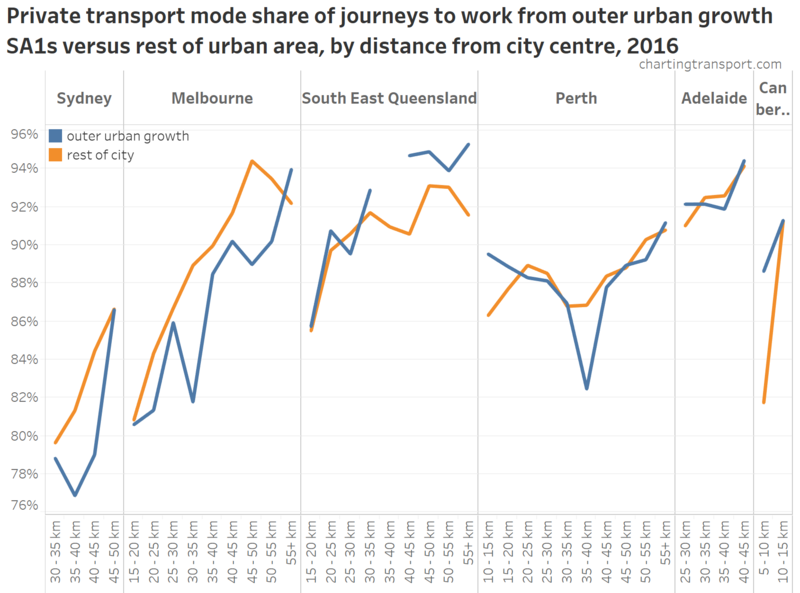 The only urban area where the existing non-outer area didn’t see net outbound domestic migration was South East Queensland. 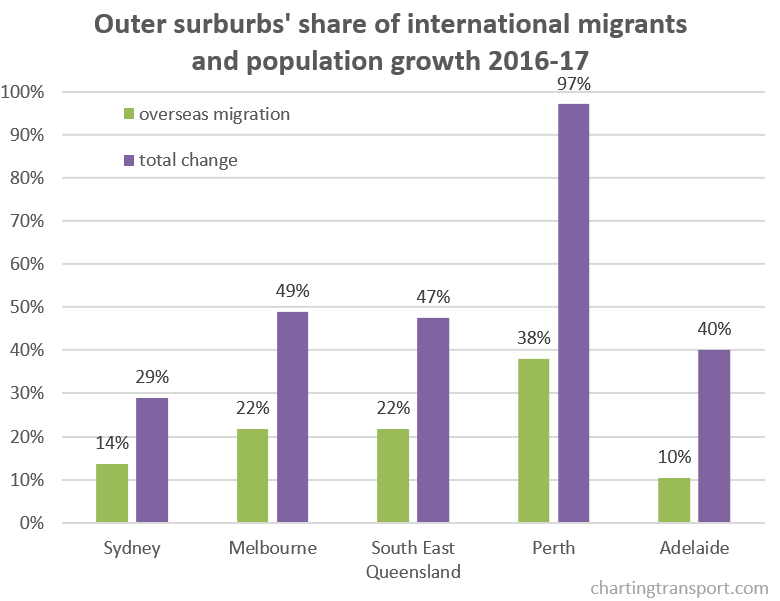 In all cities, the proportion of new international migrants settling in outer suburbs is much lower than the outer suburbs’ share of total population growth. 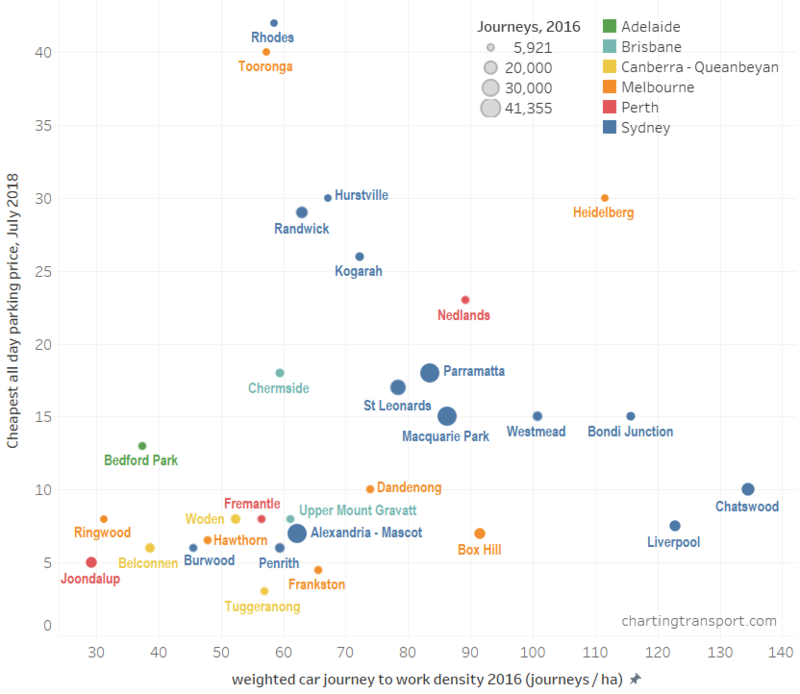 International migrants appear to prefer the inner and middle suburbs of cities (and that would certainly make sense for international tertiary students who want to be near educational institutions). 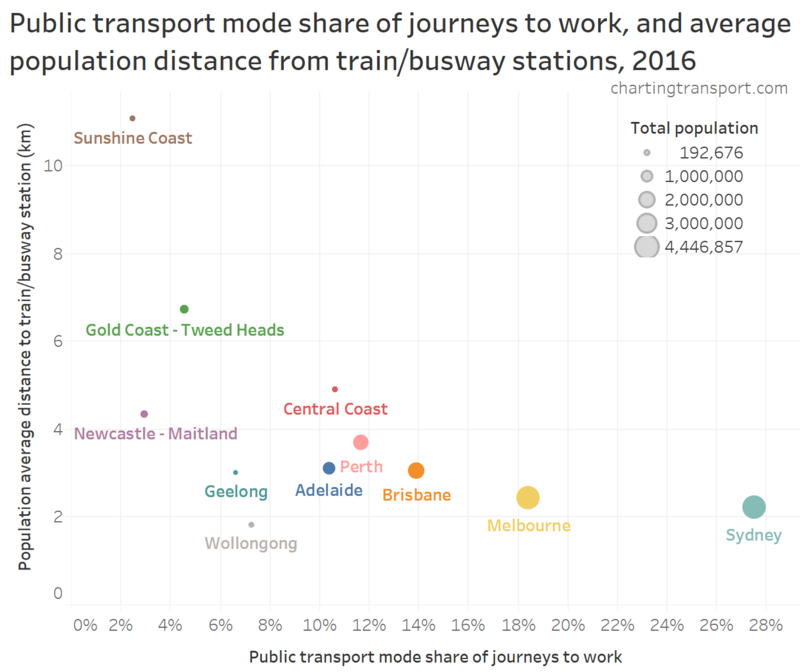 Some non-Australian residents might be confused by the term “overseas”. We use it interchangeably with “international” because Australia has no land borders with other countries. 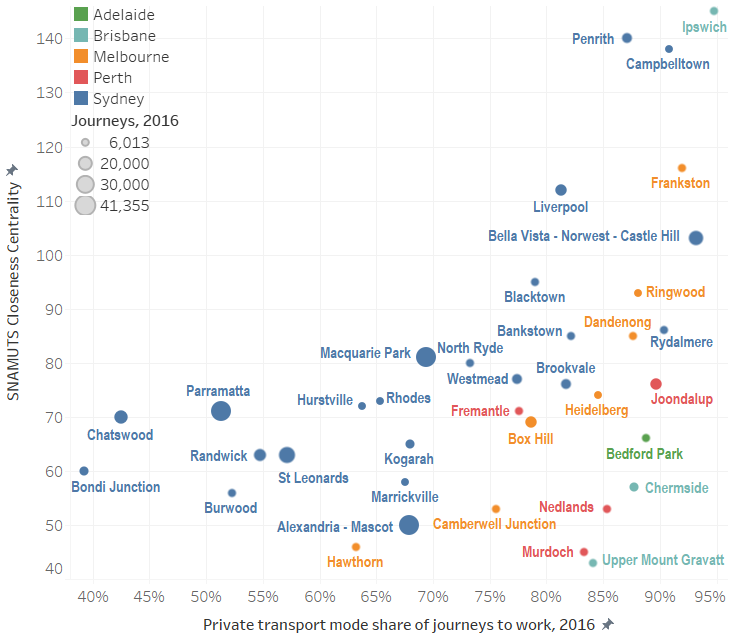 For Melbourne refer to the top of this post. 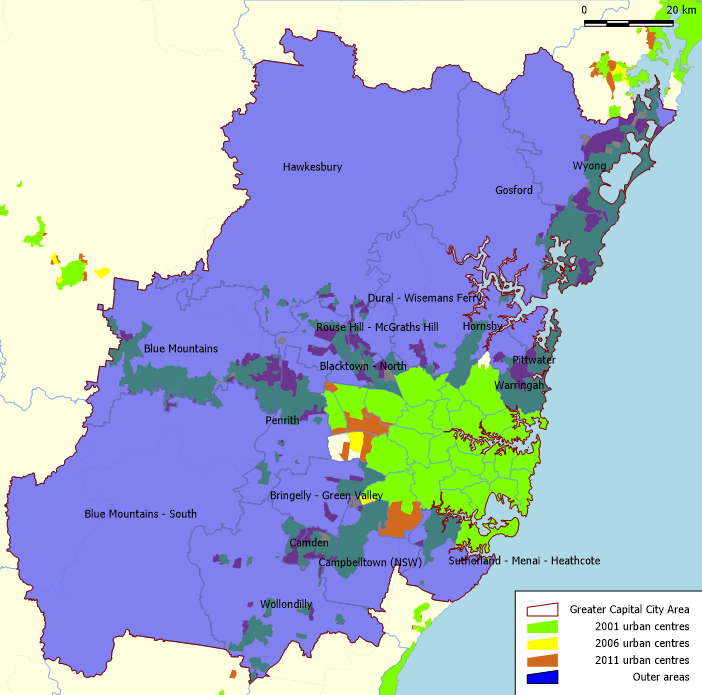 I’ve used the full Greater Capital City area, which includes the Central Coast (Gosford / Wyong). 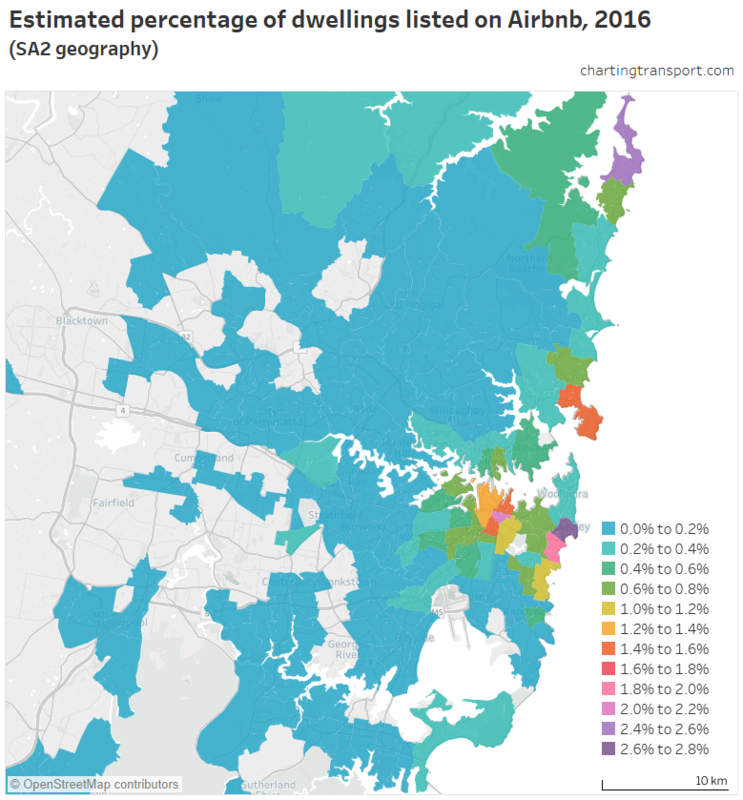 This is arguably part of a conurbation with Newcastle but I’ve kept to the Greater Sydney boundary. 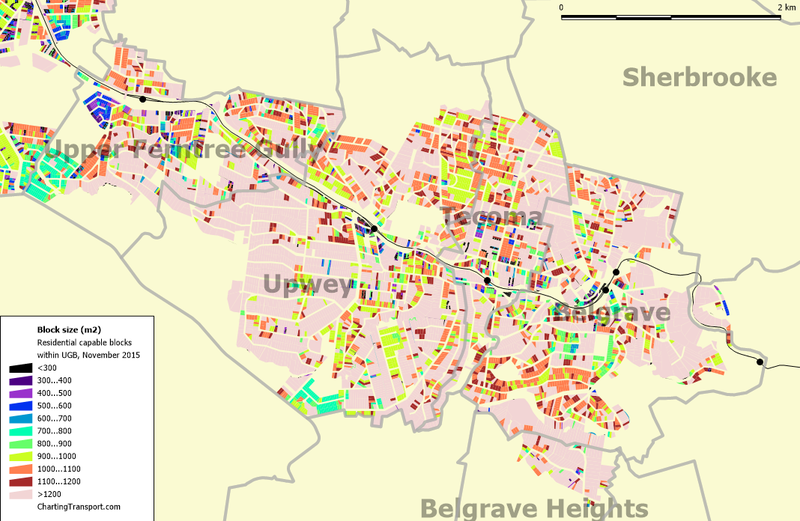 The large orange and yellow non-outer area to the west is mostly parkland or industrial, while the orange area to the south is mostly the Holsworth Military area which was defined as urban from 2011. 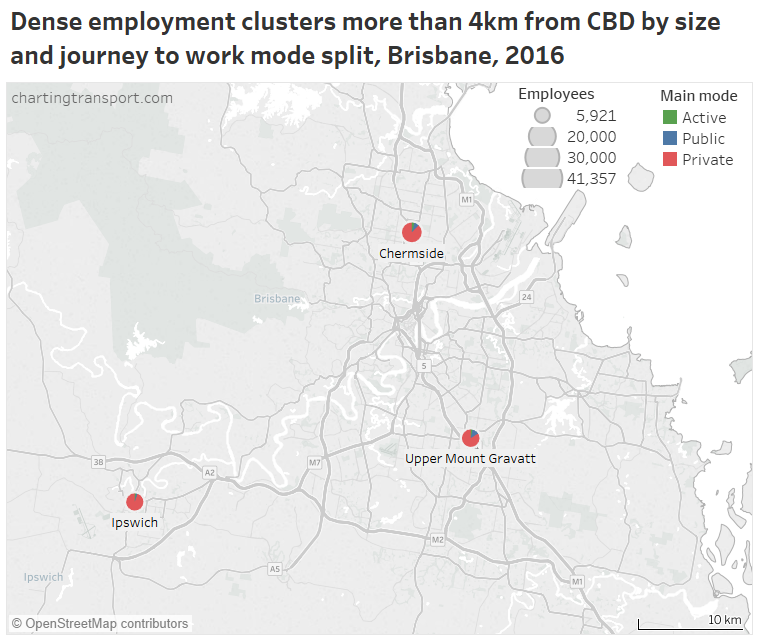 I’ve included all of Greater Brisbane, as well as the Gold Coast (as far as the border with NSW) and the Sunshine Coast. 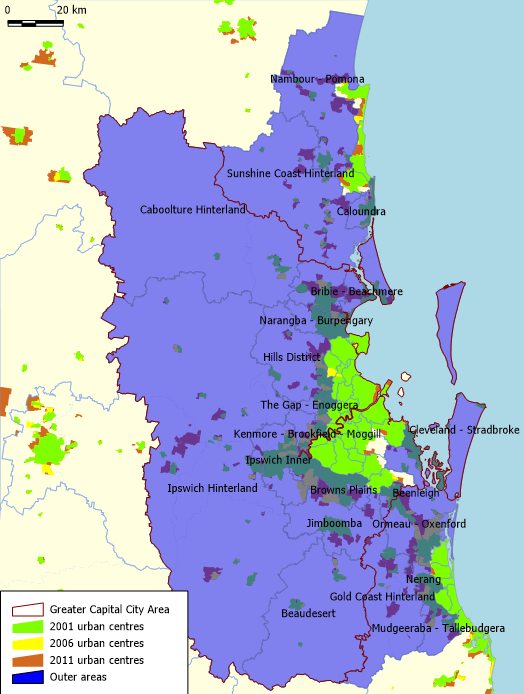 The conurbation population includes the established areas of the Gold Coast and Sunshine Coast as non-outer areas. 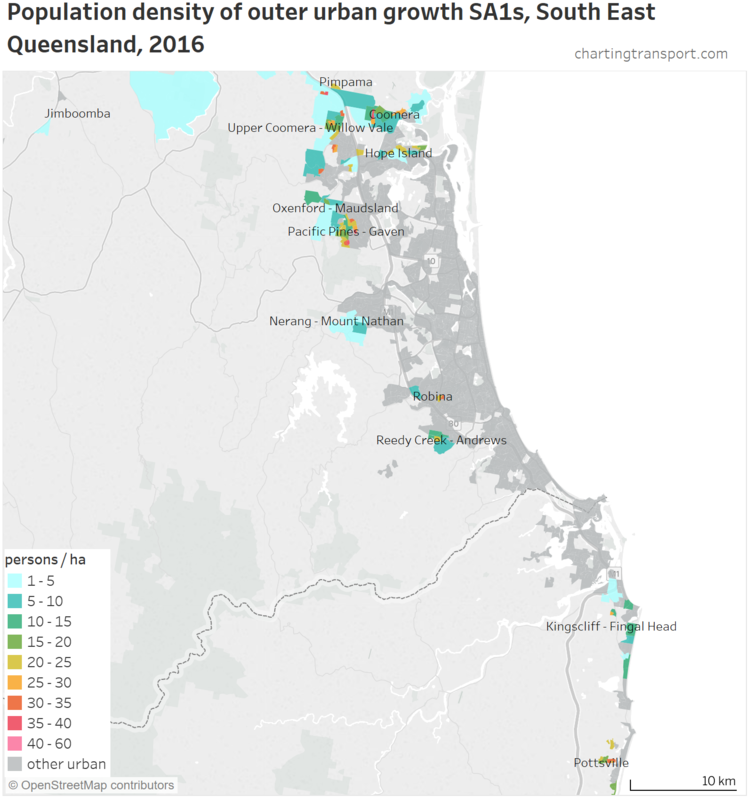 The orange areas on the Sunshine Coast mostly contain National Parks and the airport, although it also includes the relatively new suburb of Peregian Springs, so not a perfect definition. 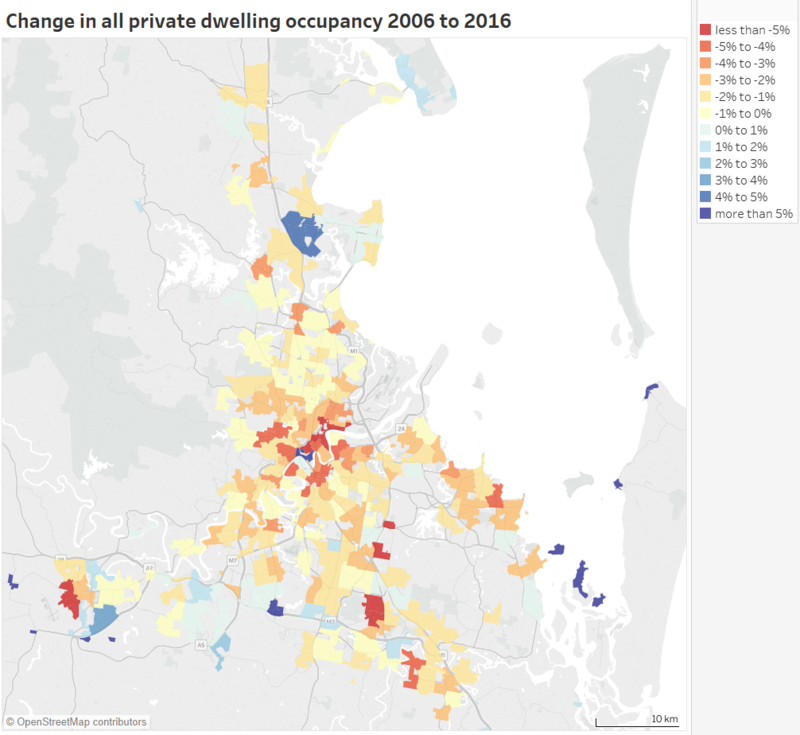 The non-outer area is fairly well-defined as almost entirely urban in 2001. 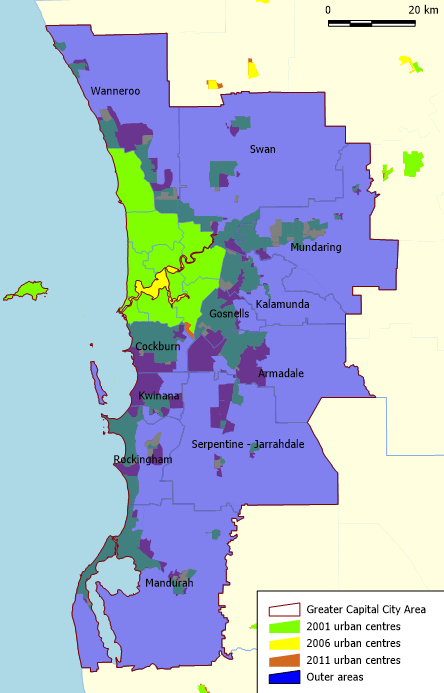 The entire of the City of Joondalup (on the northern coast, mostly surrounded by Wanneroo) counts as urban in 2001, although the suburb of Iluka in the north-western corner has developed more recently, so the calculation won’t be perfect. 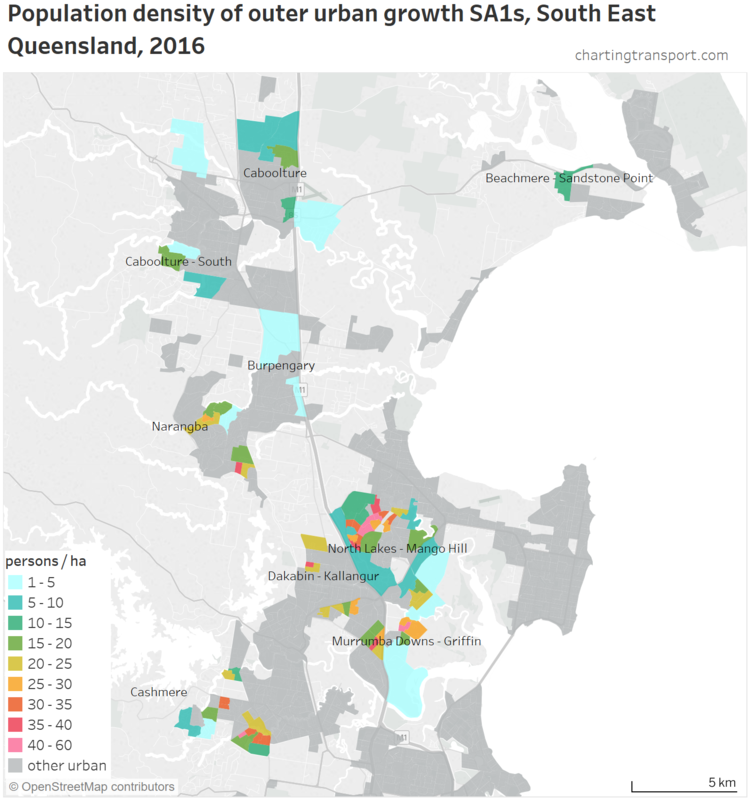 The two large orange areas in the non-outer area are non-residential, so there will be little fringe growth outside the blue area. 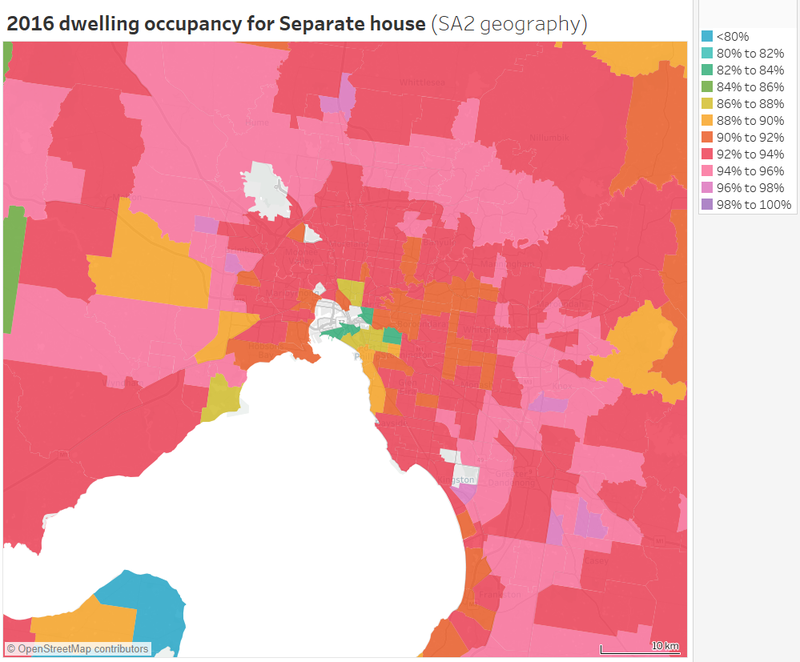 Are Melbourne’s suburbs full of quarter acre blocks? 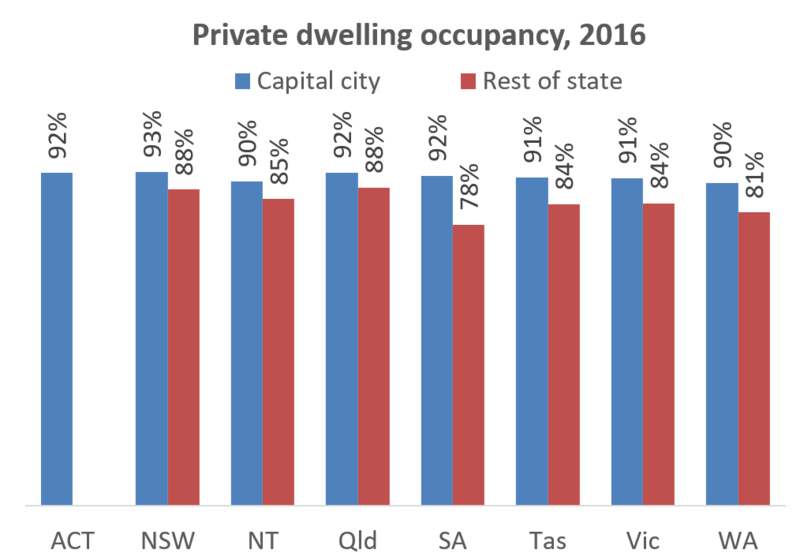 A lot has been said about the great Australian dream of moving to the suburbs and living on a quarter acre block. 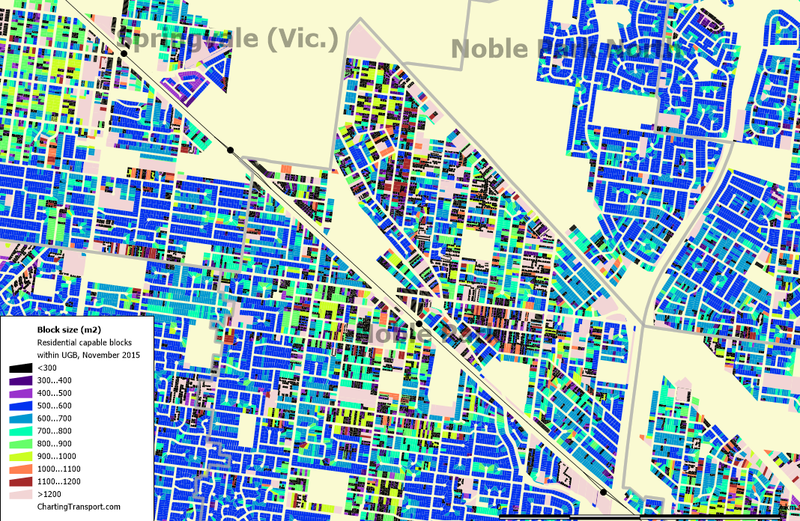 But is Melbourne suburbia actually full of quarter acre blocks? Where are they to be found? 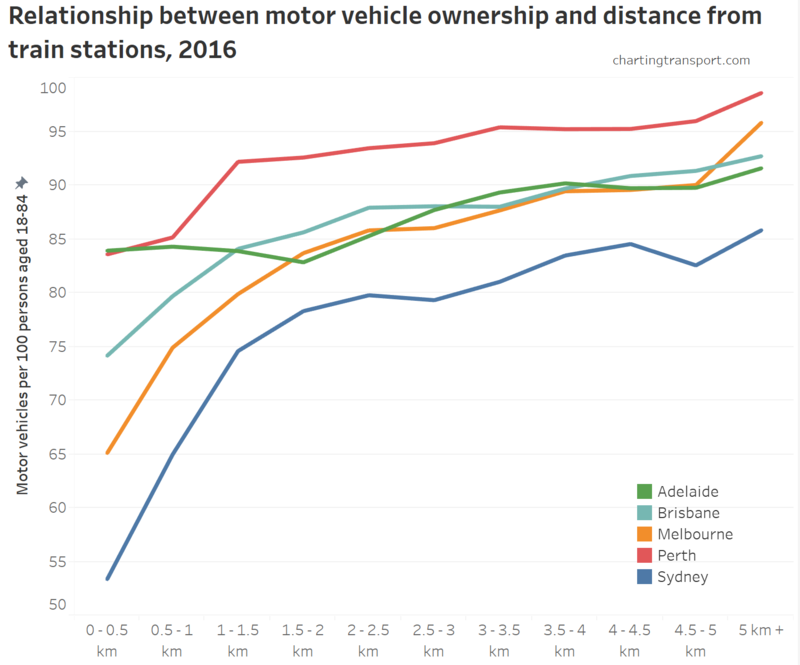 Are they disappearing? 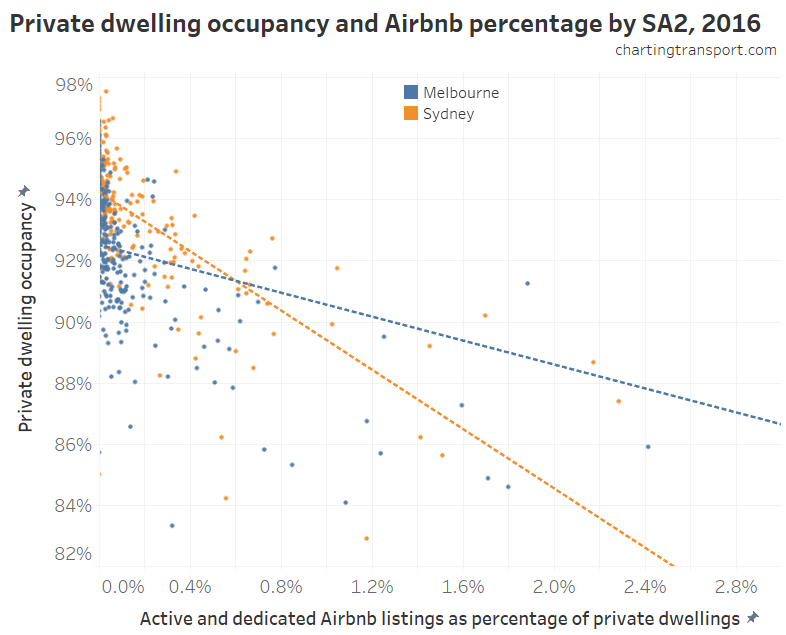 This post delves into block sizes in Melbourne. 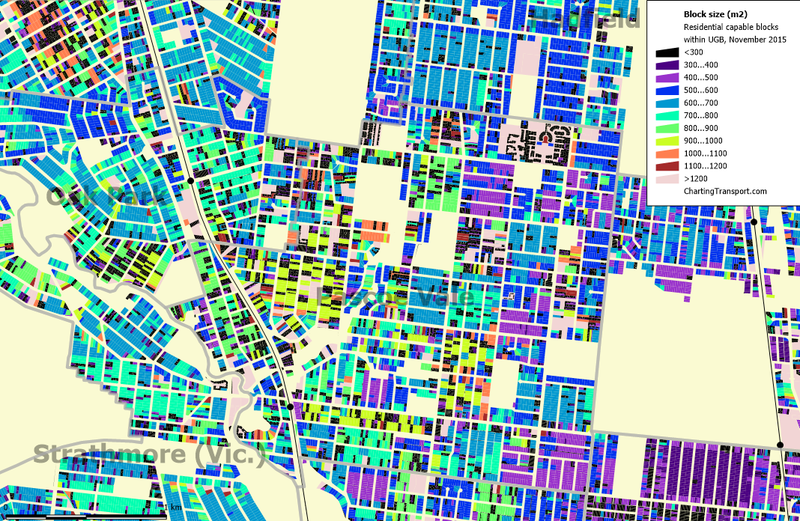 Where are the quarter acre blocks? 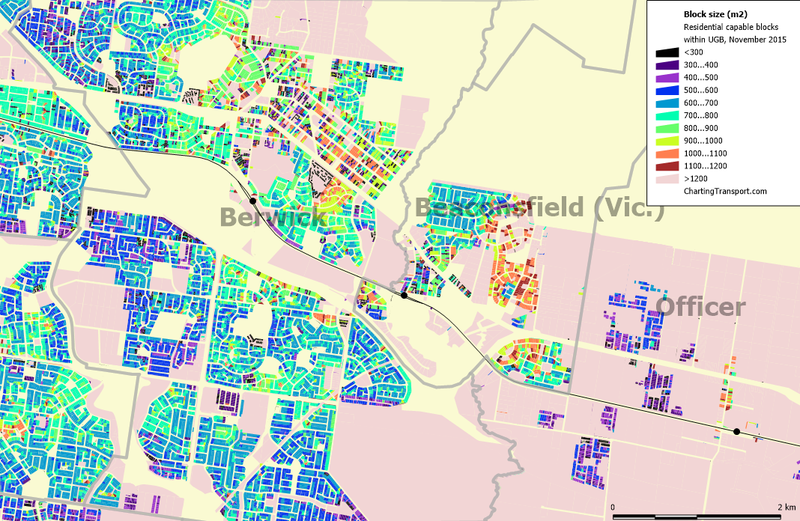 A quarter-acre translates to 1011.7 square metres in modern units, but for the purposes of this post I’ll allow some leeway and count any block between 900 and 1100 square metres. 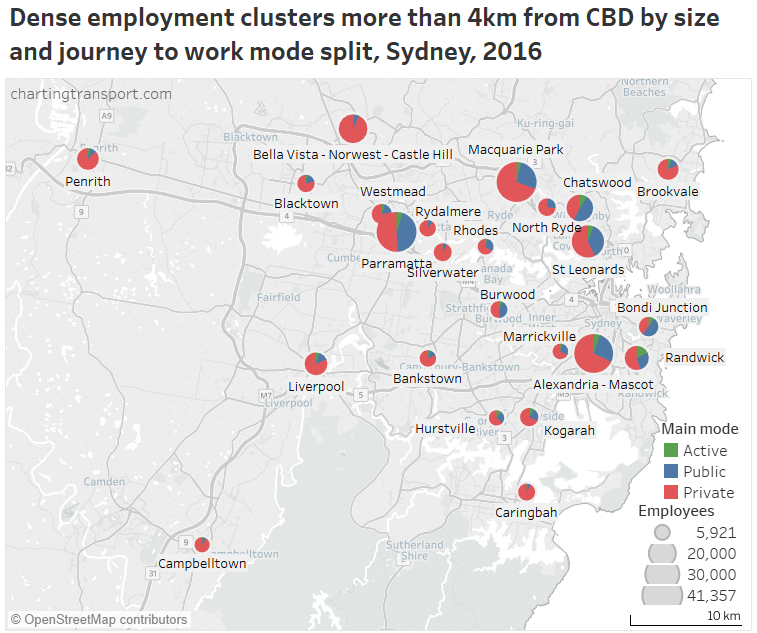 For this post I’ve also filtered out blocks in planning zones that cannot include dwellings (eg industrial areas), but that does mean I’ve included blocks in mixed use zones, commercial zones, etc. 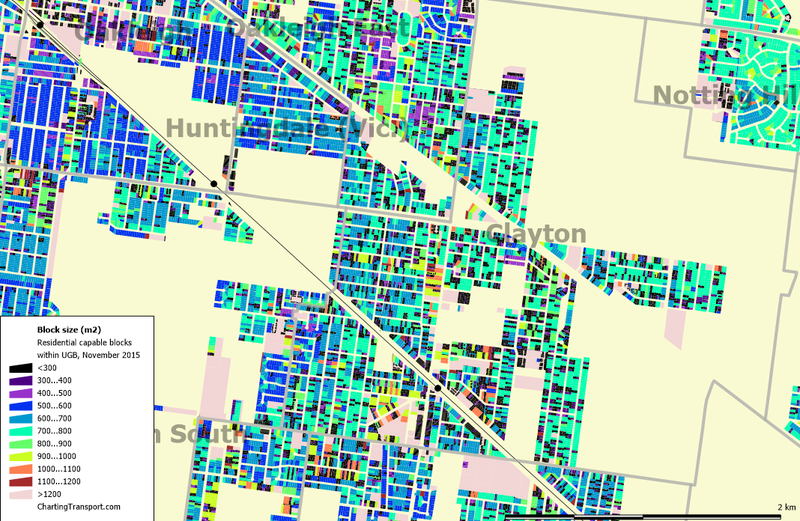 So not every block counted is residential. 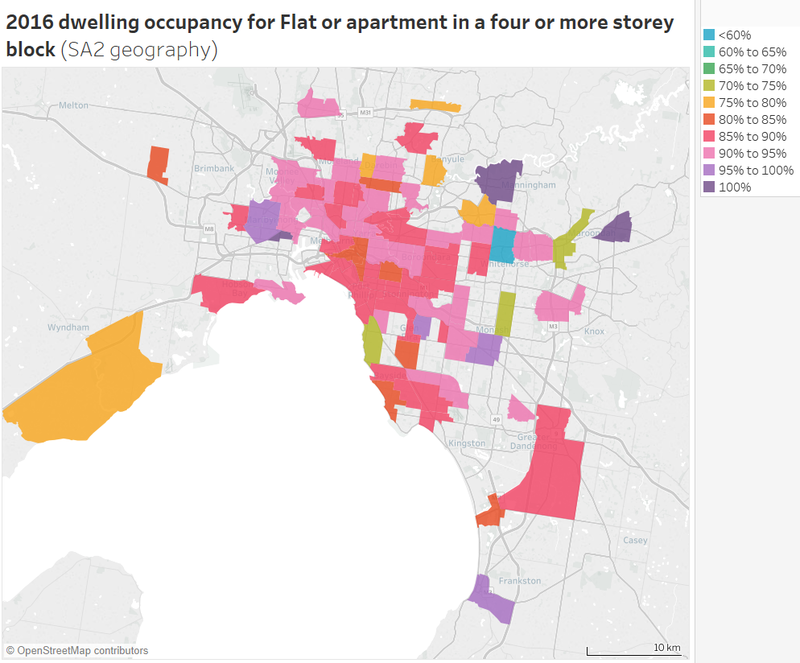 Also some larger blocks might contain multiple small dwellings but not actually be subdivided (eg a block of flats). 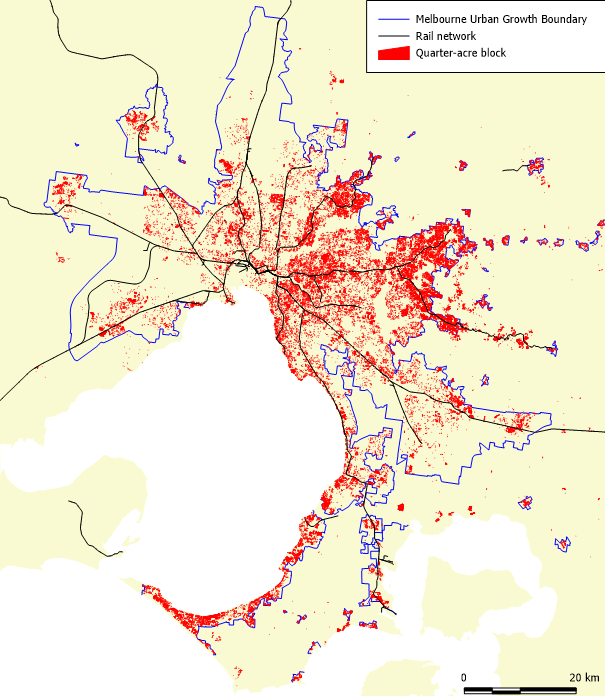 First up, here is a map of Melbourne showing the prevalence of quarter acre blocks. 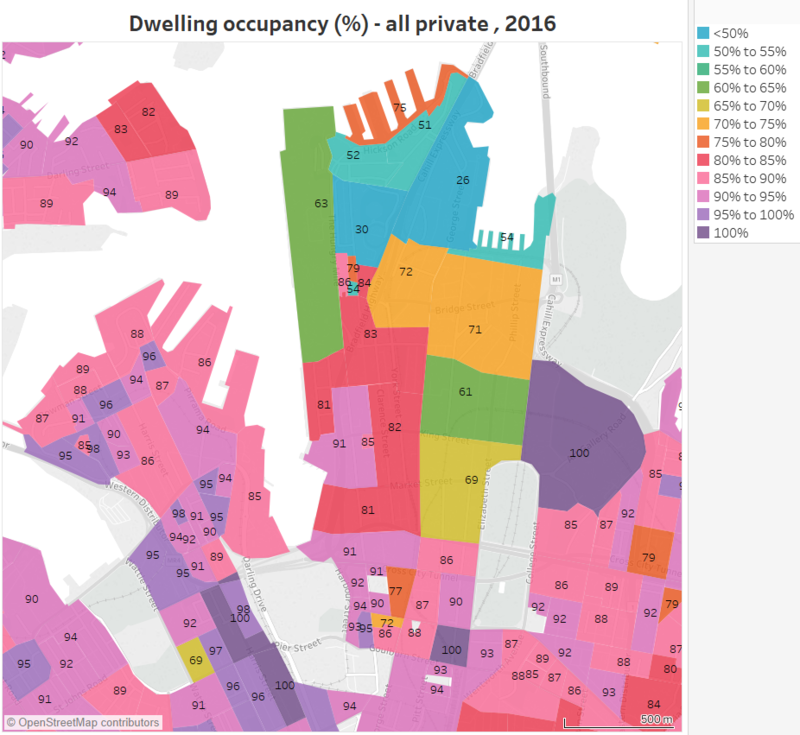 It looks like there are lots of them, but because the blocks are so small, the total area occupied by quarter-acre blocks is significantly over-represented on this large scale map. 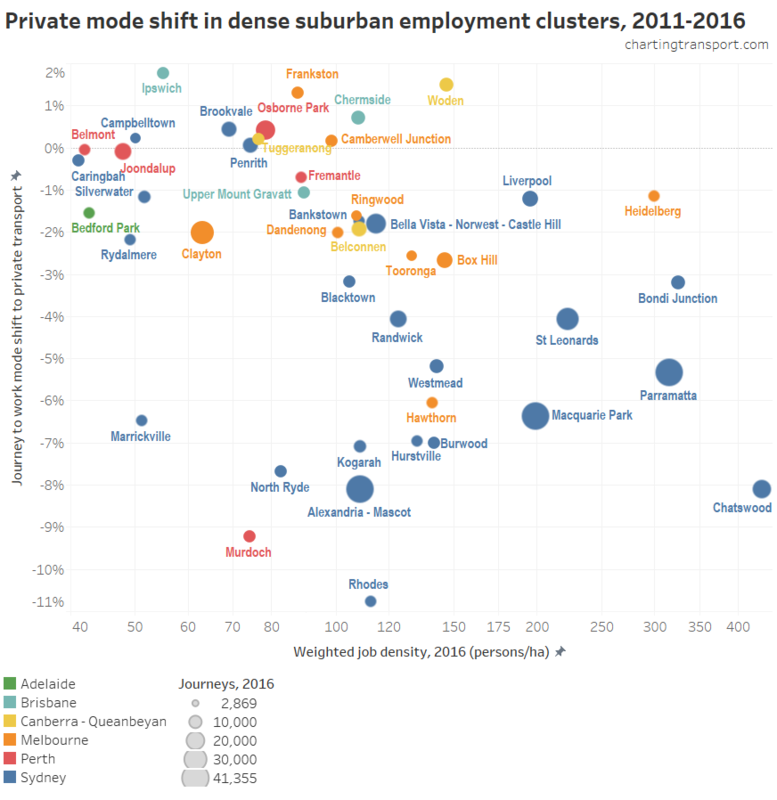 There are larger concentrations in the outer north-east and outer-east, but very few blocks in the current growth areas to the west, north and south-east. 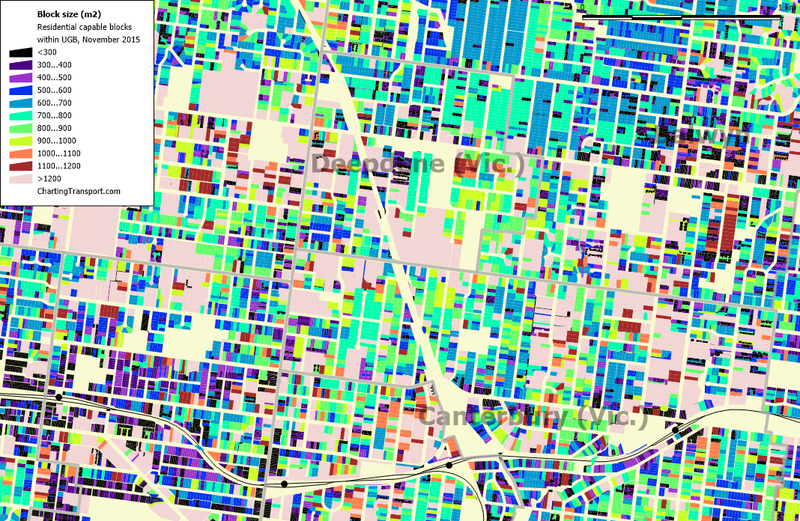 There are almost 78,000 quarter-acre blocks within Melbourne’s Urban Growth Boundary, which sounds like a lot, but is only 3.75% of the 1.8 million blocks in my dataset. 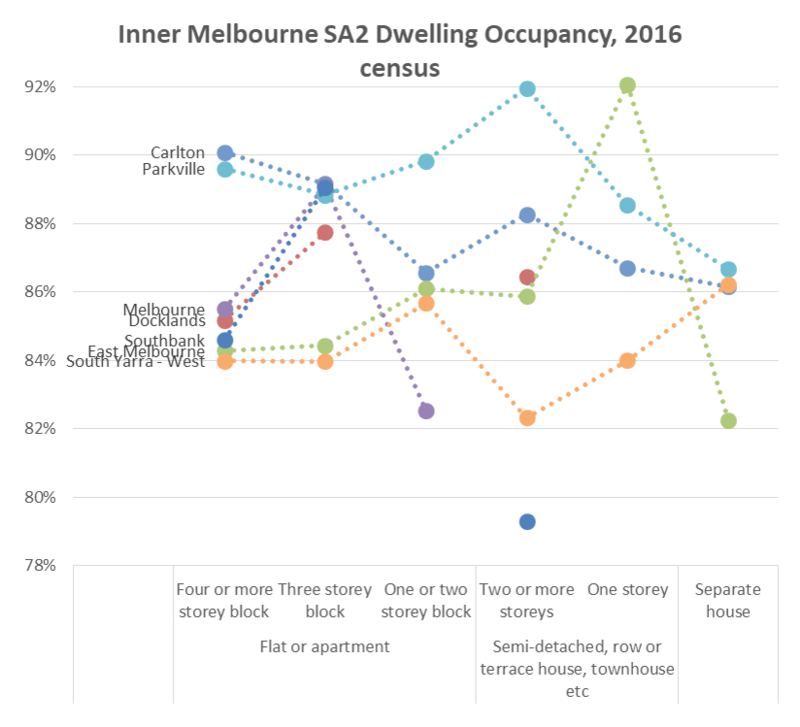 So what are typical block sizes in Melbourne? 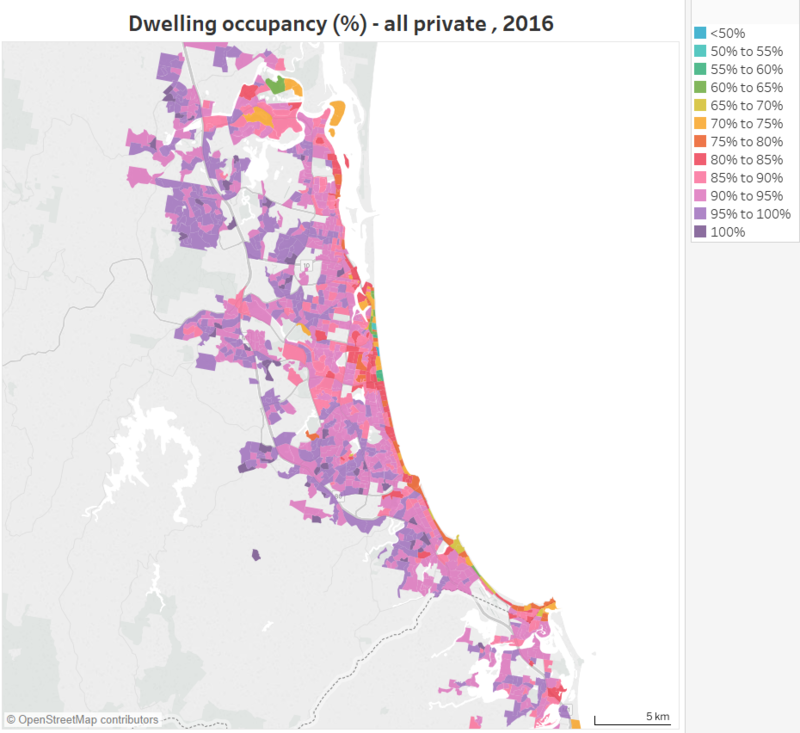 For this analysis I’m considering blocks within land use zones that can include dwellings, that are also within the urban growth boundary. 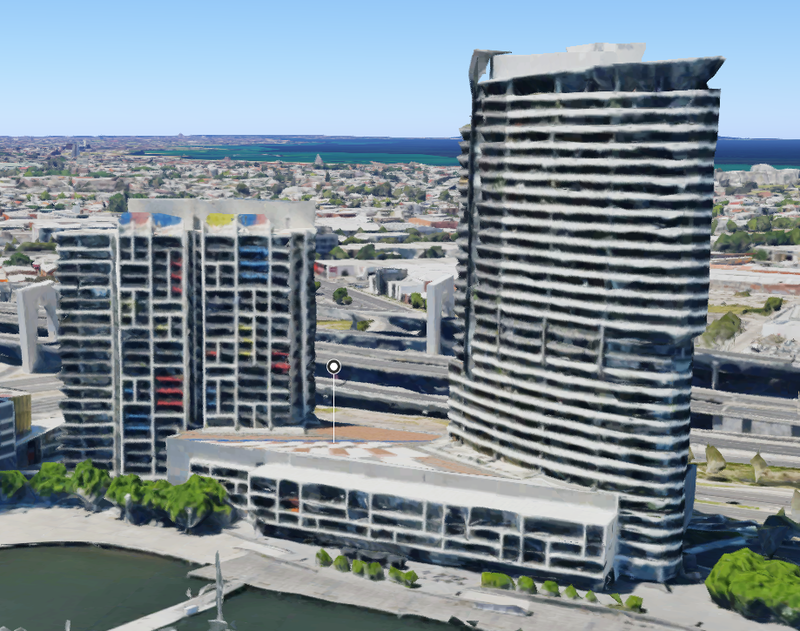 But I’ve excluded blocks of less than 40 square metres on the assumption these are unlikely to contain dwellings. 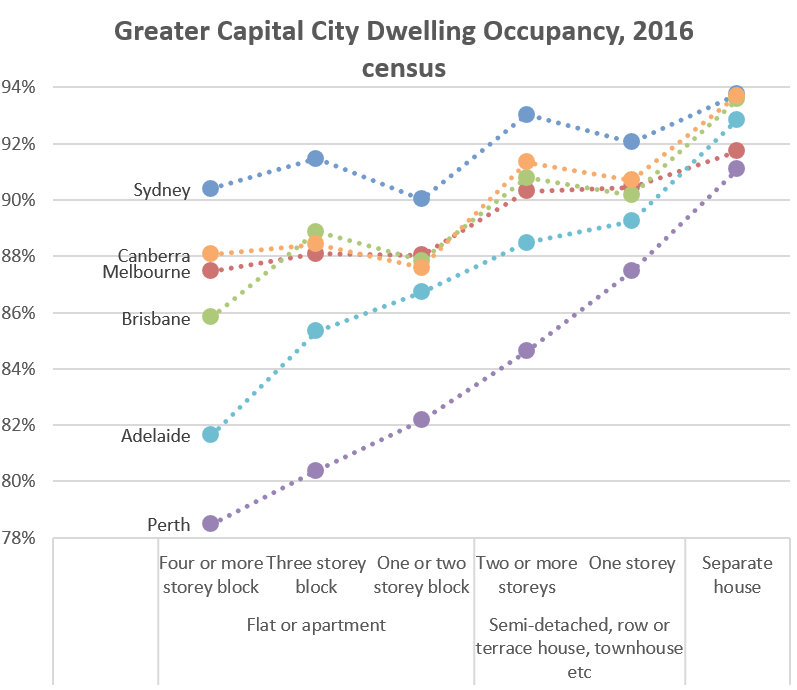 The most common block size is 640-660 square metres, and 34.5% of blocks are between 520 and 740 square metres. 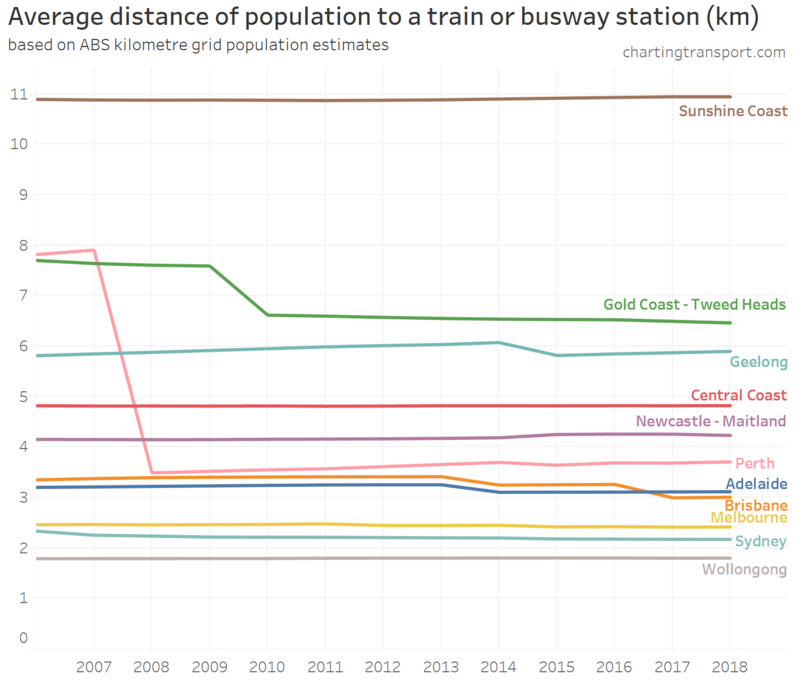 The median is 540-560 square metres. 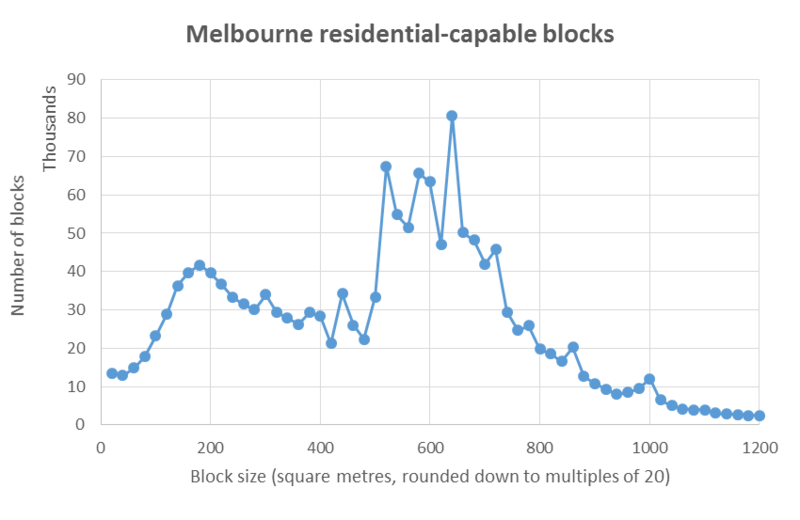 180-200 is the most common smaller block size, and there is a small spike in block sizes of 1000-1020 square metres, which includes the quarter-acre block. 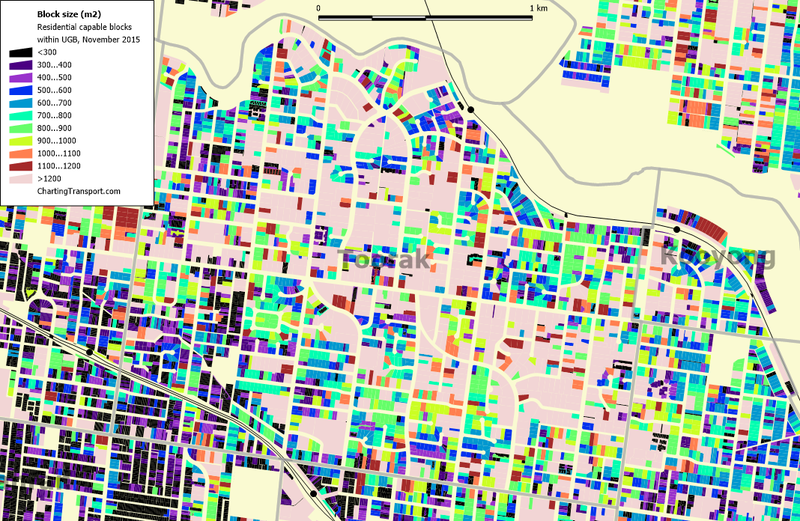 But quarter-acre blocks are certainly very uncommon. 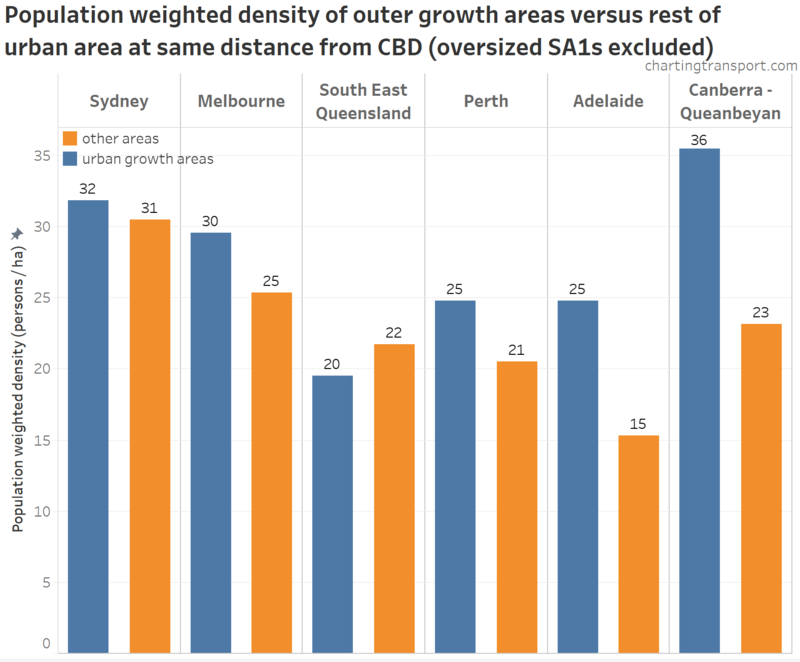 I’ve calculated the median block sizes for all suburbs within Melbourne’s Urban Growth Boundary. 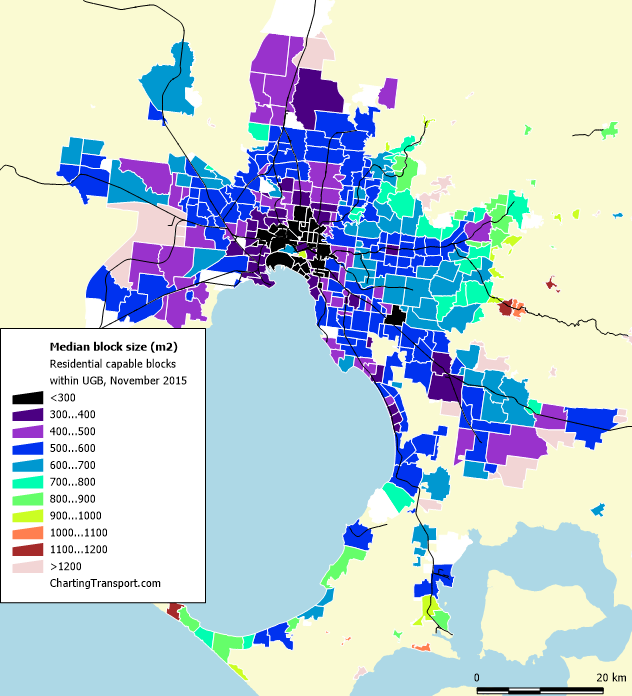 The inner city has median block sizes under 300 square metres, and 300-500 is typical in the inner northern and western suburbs. 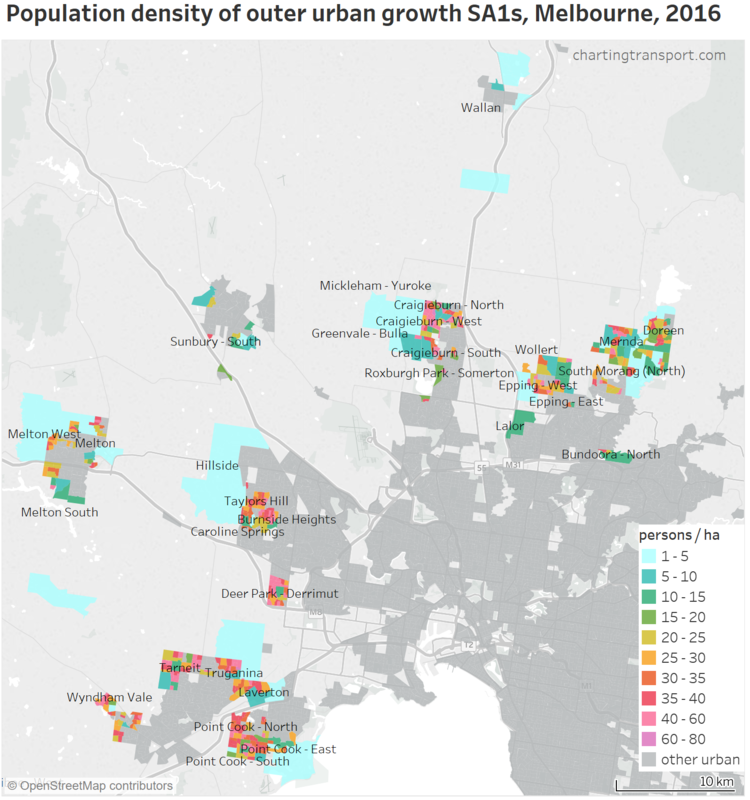 Block sizes are larger in the middle and outer eastern suburbs, older suburbs in the south-east, and blocks along the Mornington Peninsula. 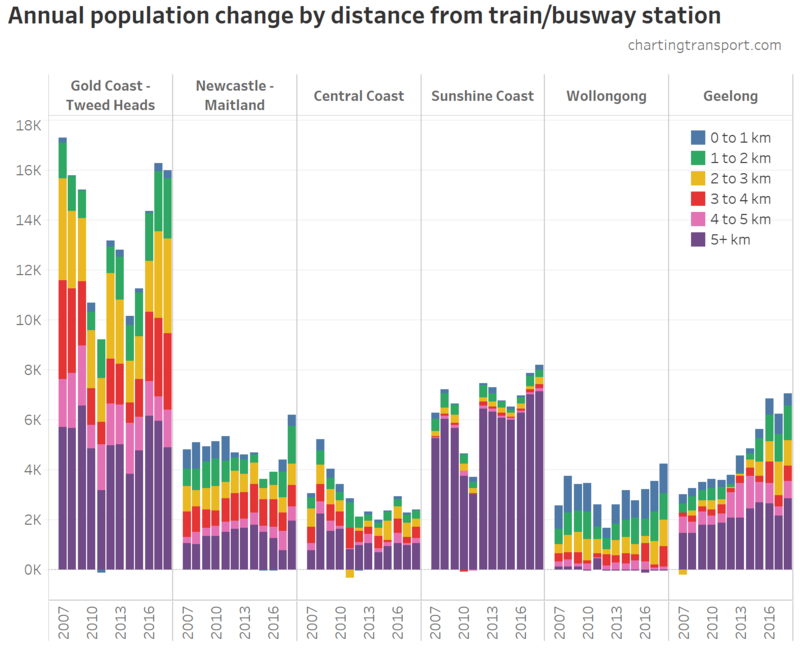 But the more recent growth areas to the west, north and south-east see median block sizes of between 400 and 500 square metres (purple), reflecting higher dwelling densities encouraged by current planning policy for growth areas. 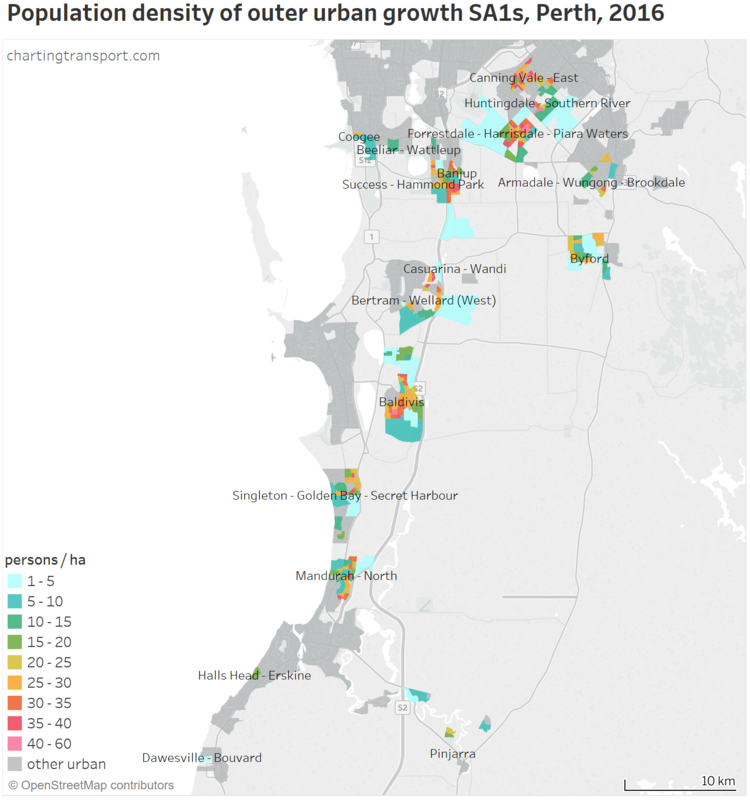 Quarter-acre blocks are the median only in places like Upwey, Belgrave and Portsea. 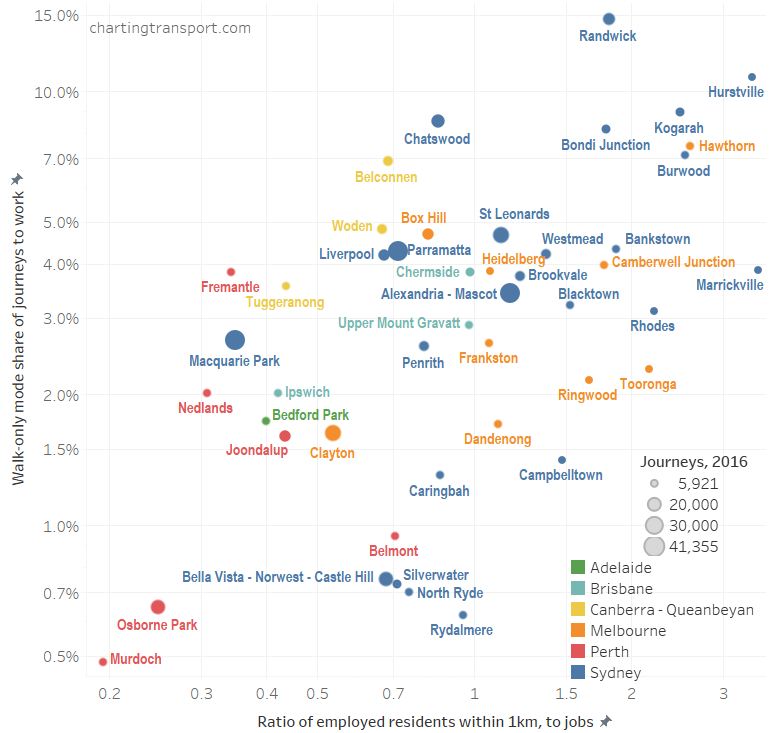 Inner city Carlton has the lowest median of 100-120 square metres, followed by Cremorne, North Melbourne, South Melbourne at 120-140 square metres, and then Abbotsford, Fitzroy North, Port Melbourne, Richmond, West Melbourne at 140-160 square metres. 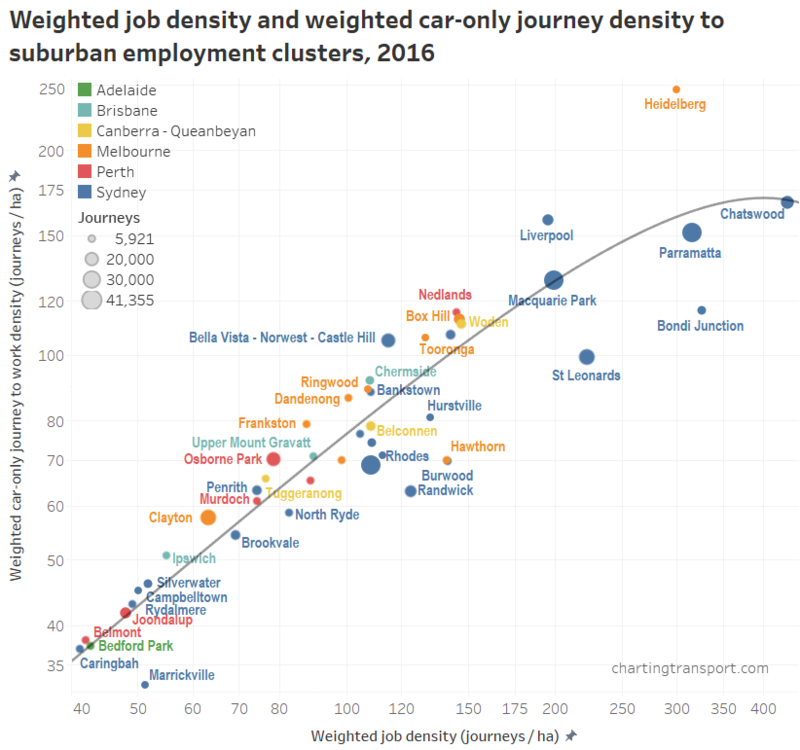 Urbanised suburbs at the other end of the scale include Park Orchards at 3020, Selby at 1440, and Warrandyte at 1260. 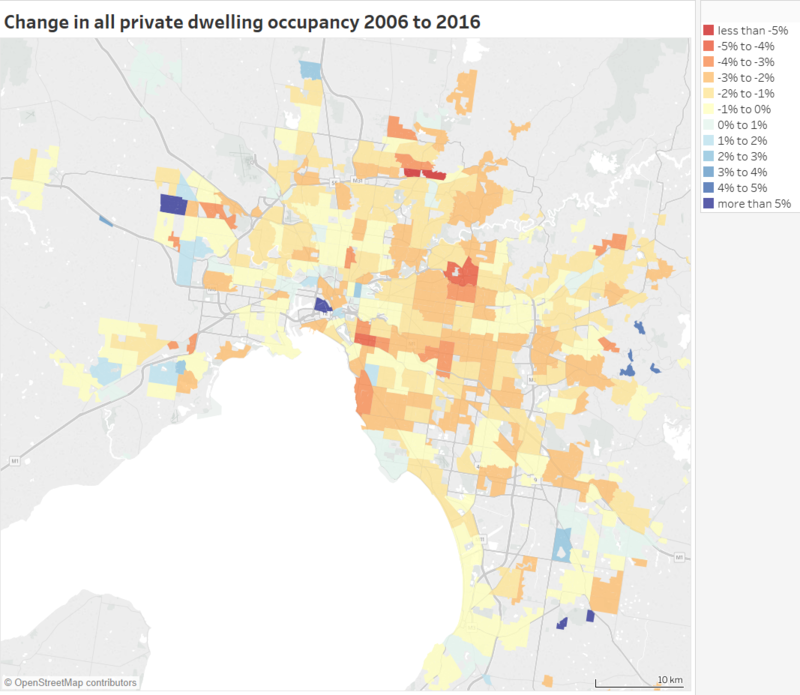 There are two interesting outliers in the central city: Southbank (in yellow) has a median block size of 980 square metres, and Docklands (in blue) has a median of 660 square metres. 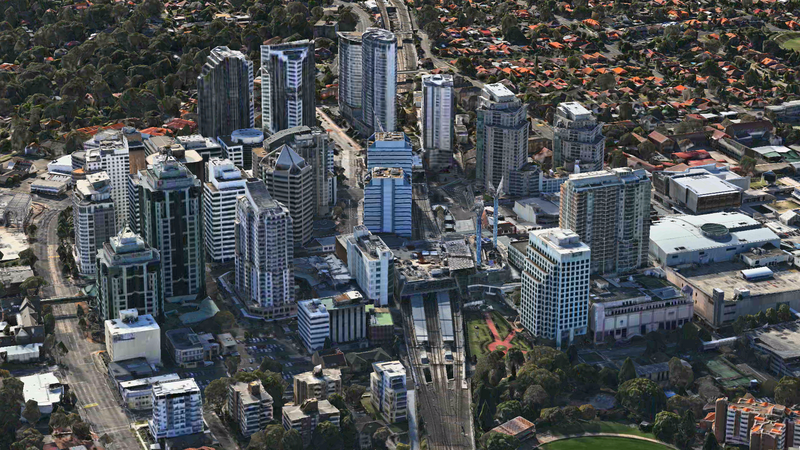 Both have been redeveloped in recent decades with many medium to high-rise apartment towers on those larger blocks. 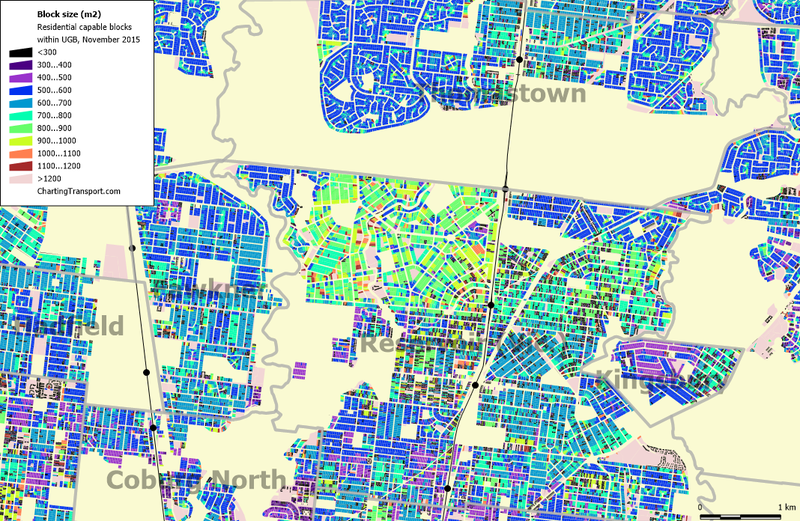 Beyond these medians, there is a lot of variation within suburbs. Let’s go for a wander around the city. 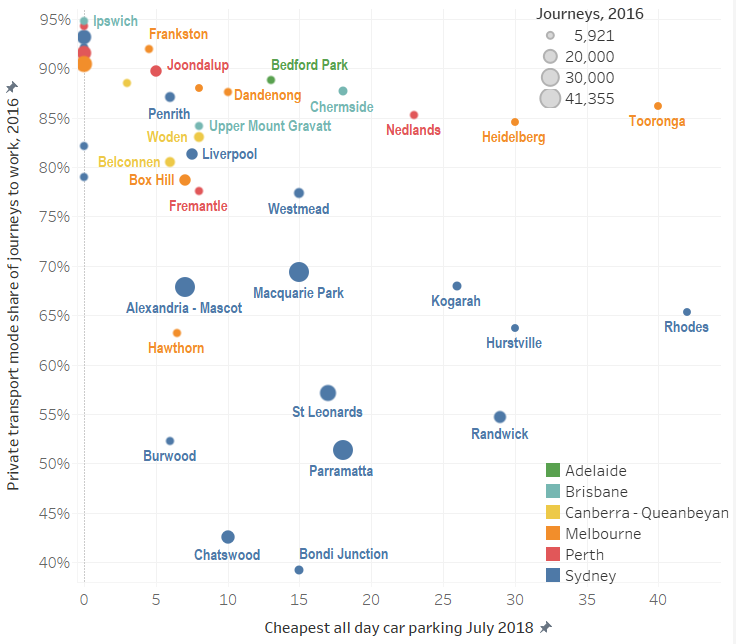 Mooroolbark has the highest count of quarter-acre blocks and a median size of 840 square metres. 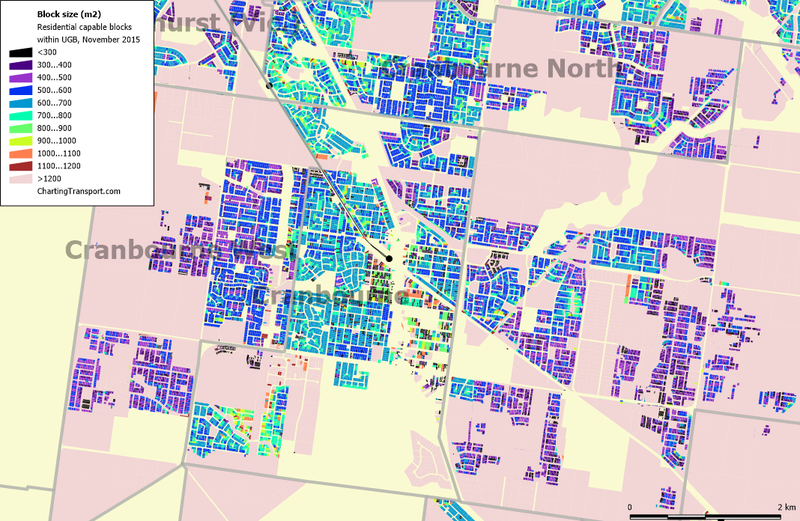 As well as larger blocks, you can see a lot of further subdivision, particularly close to the train line (thin black line). 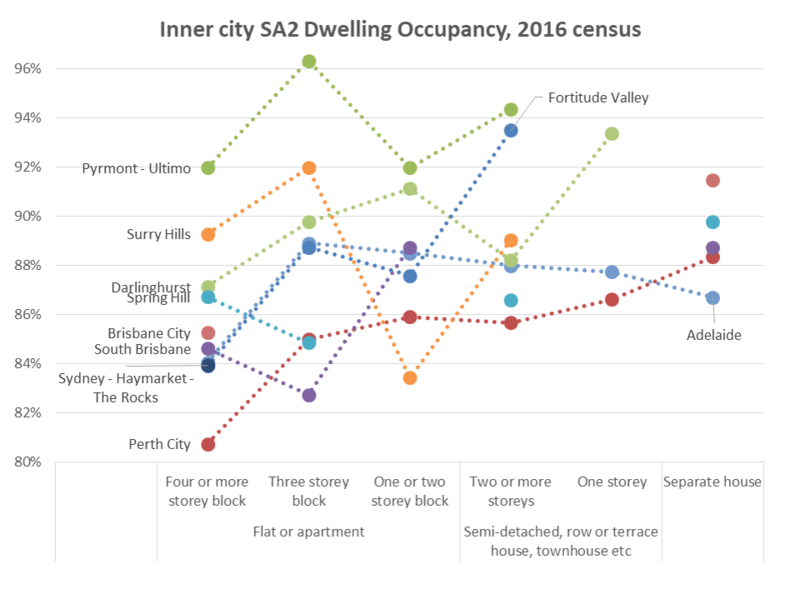 While blocks of 700-800 square metres were probably typical in the original subdivision, further subdivided blocks now outnumber the larger blocks, with a median of 260 square metres. 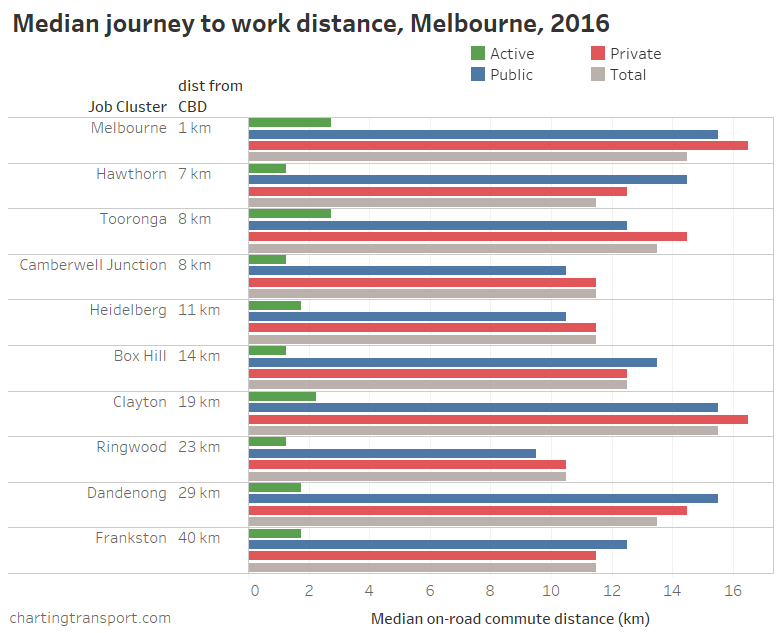 Clayton of course is home to a major Monash University campus, and I suspect a lot of the smaller blocks house students. 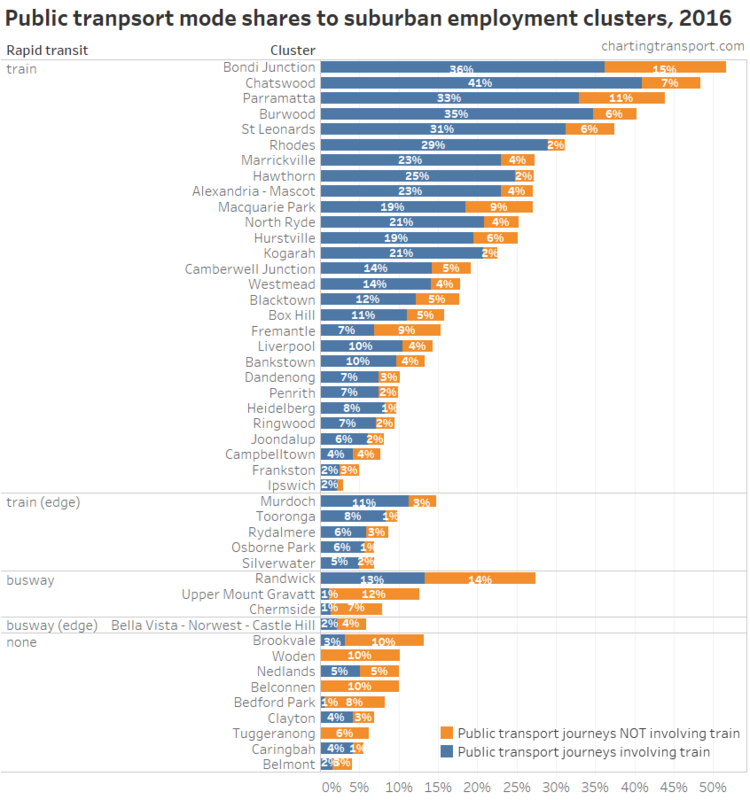 Heading further south, Cranbourne is an interesting mix. 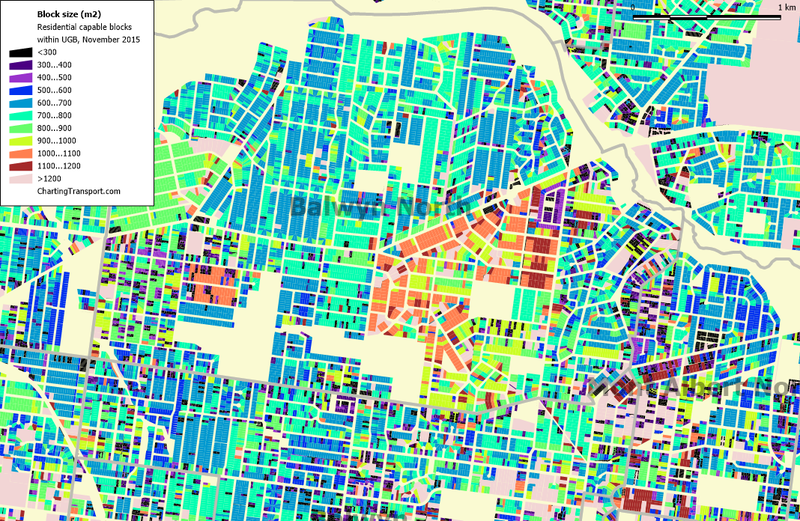 The inner core (old town) has larger blocks but lots of further subdivision. 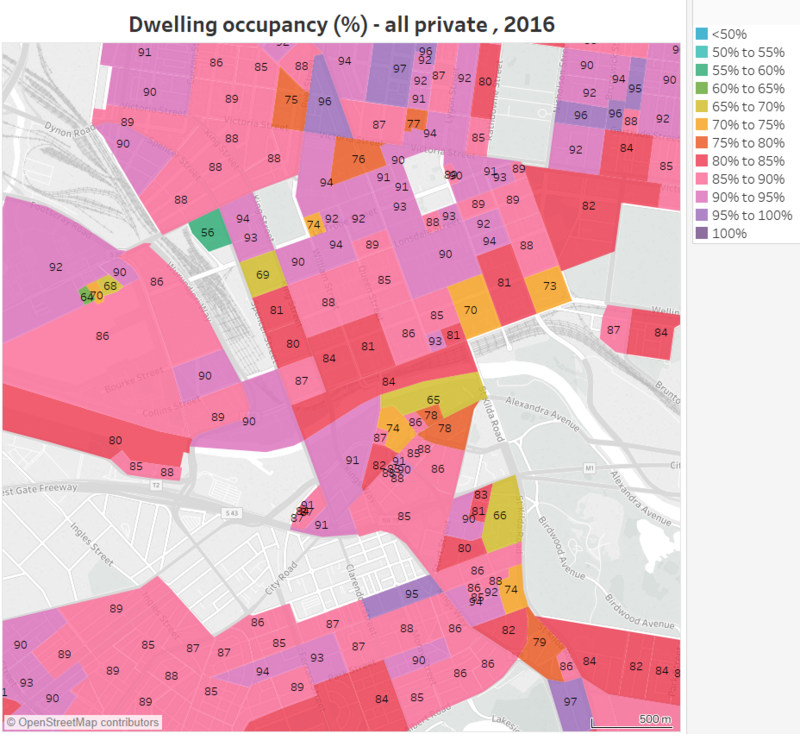 This is surrounded by many blocks of around 700-800 square metres, but the most recent development has much smaller bocks, most less than 500. 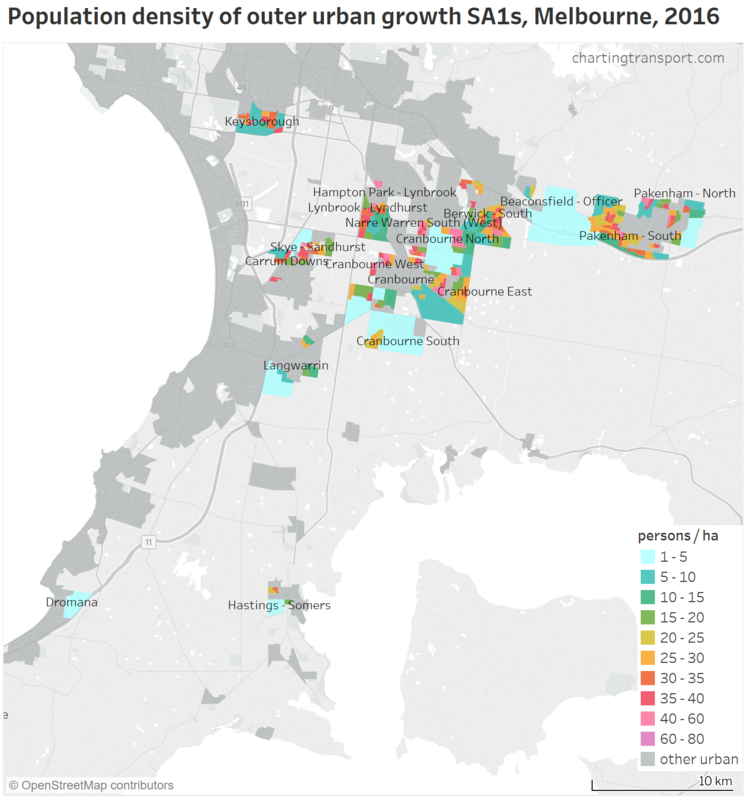 It’s a bit like tree rings, with each ring of incremental urban growth reflecting the preferred new block size of the time. 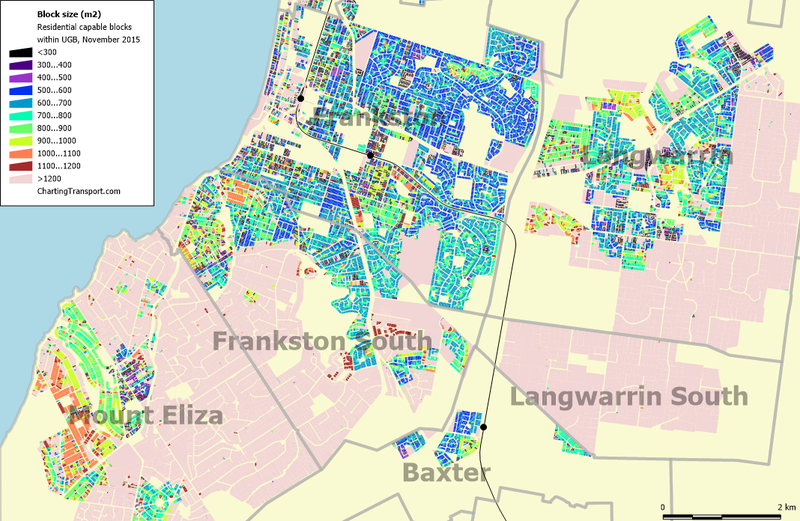 Again significant further subdivision in central Frankston, a variety of block sizes in different parts of Langwarrin, and lots of large blocks in Frankston South and Mount Eliza (in some of the pink areas most blocks are over 2500 square metres). 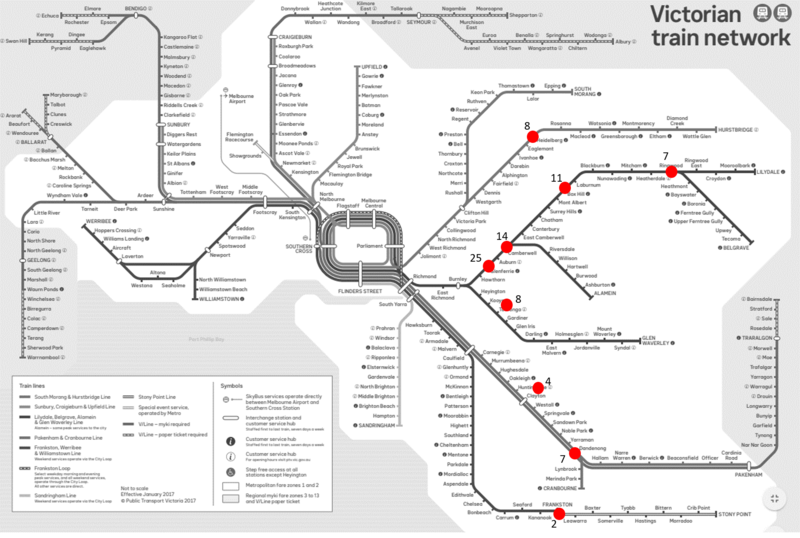 The large block area to the west of the train line was apparently developed around the 1960s. 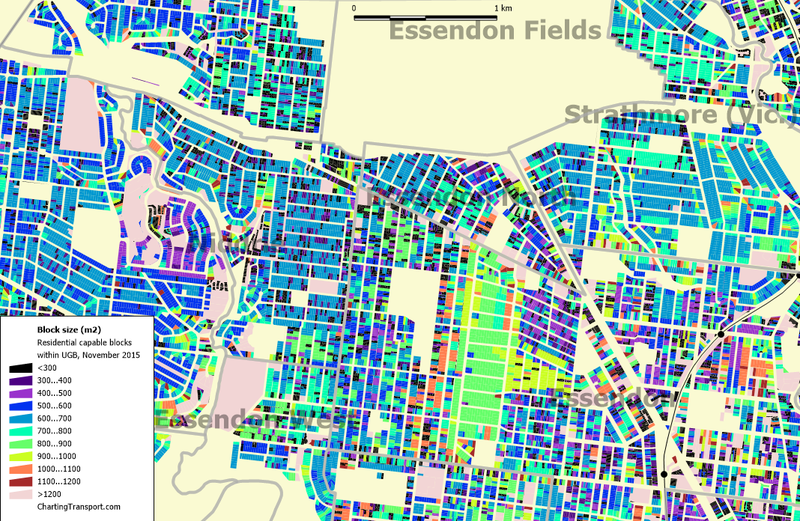 The north-west corner of Templestowe has not too many larger blocks yet to be subdivided. 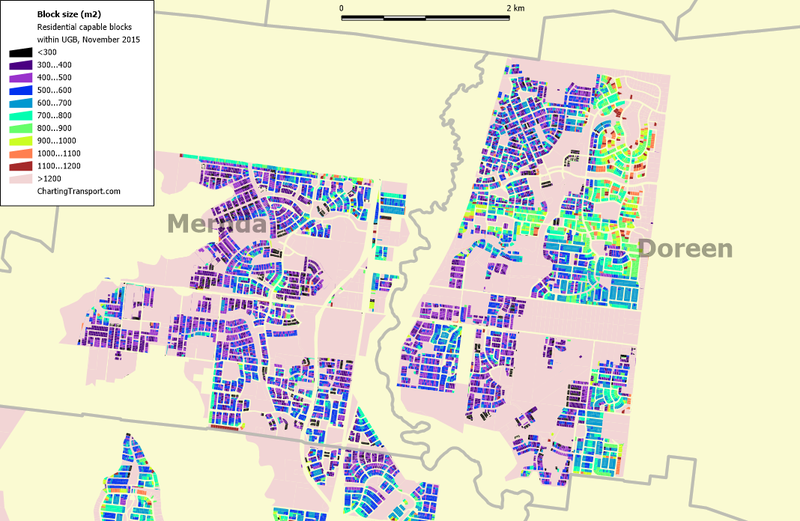 But to the south-east you can see areas with blocks larger than 1200 square metres (light pink). 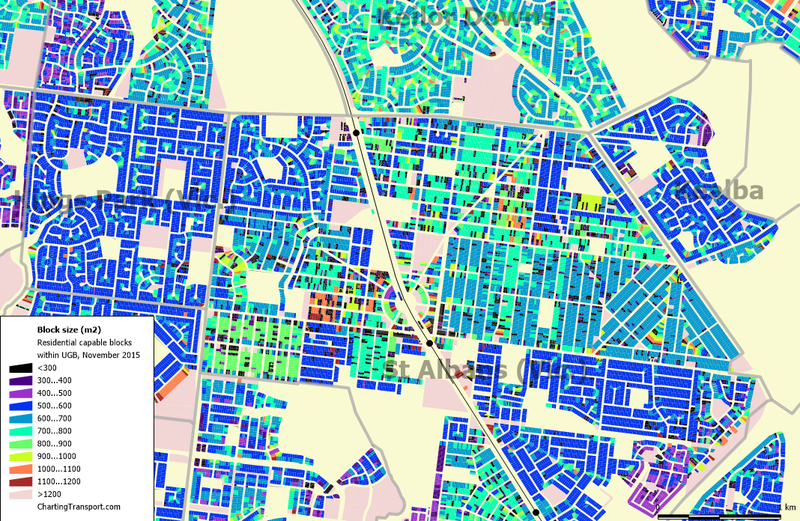 The area around Eltham has many large blocks, including many larger than quarter-acres. 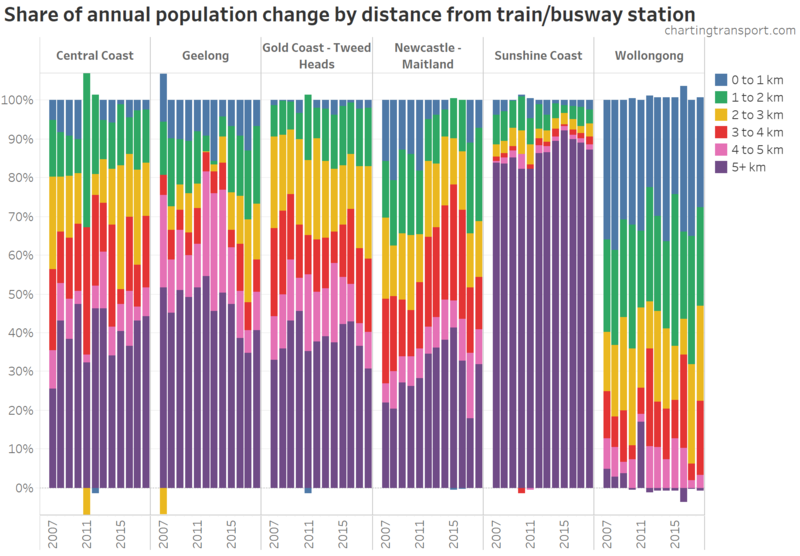 There has been quite a bit of subdivision around the rail stations however. 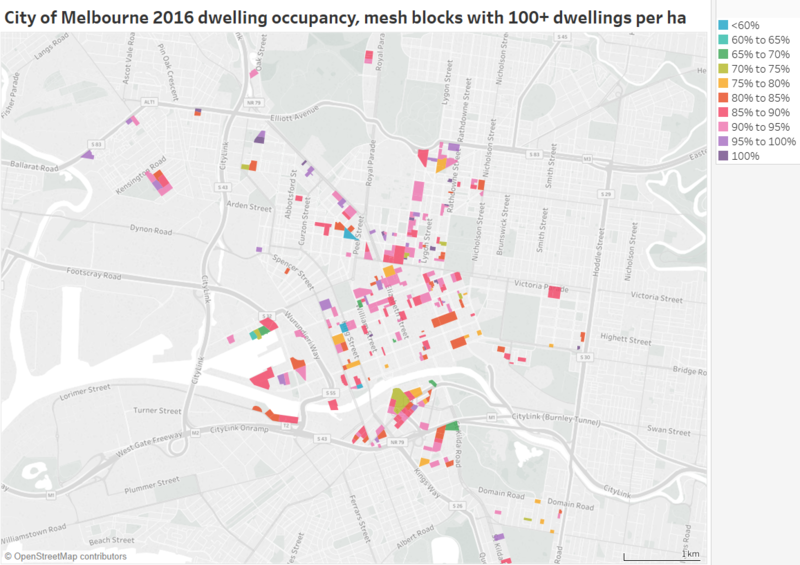 A significant proportion of blocks are larger than a quarter-acre, with a median of 1060 in Belgrave, 1120 in Upwey, 1000 in Tecoma, and 980 in Upper Ferntree Gully. 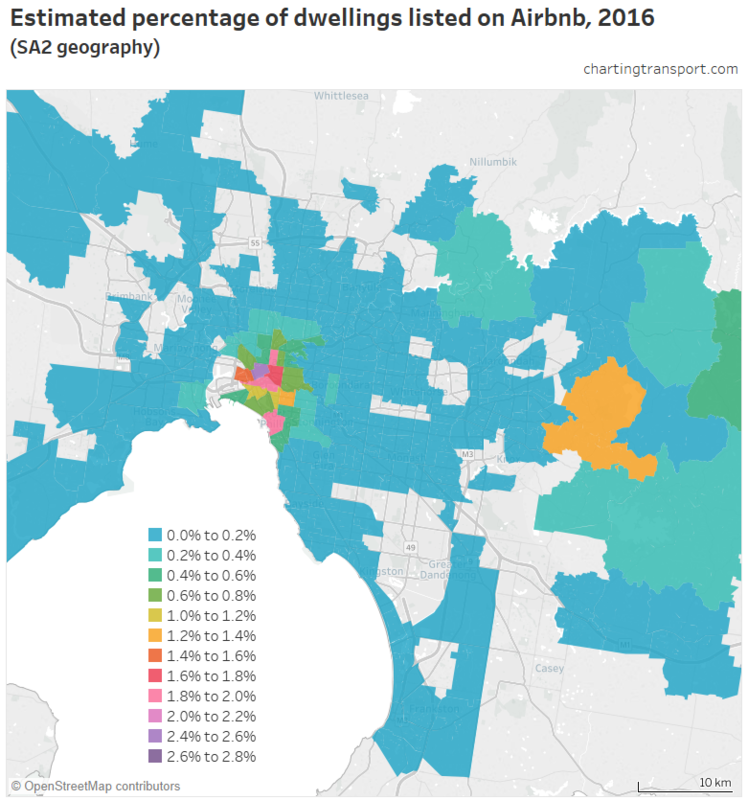 If you want a quarter-acre block relatively close to the city, then Balwyn North has quite a few (many with swimming pools). Good luck saving a deposit for those. 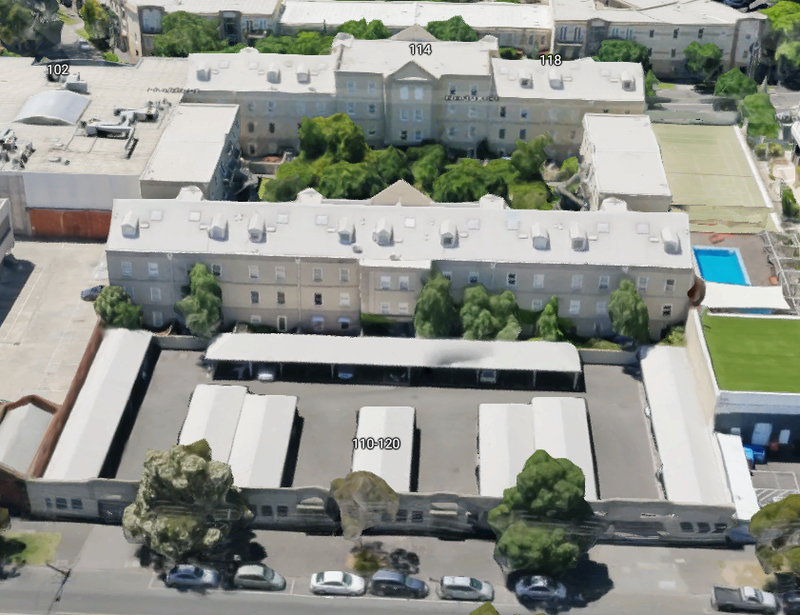 Or of course Toorak with plenty of very large blocks even closer to the city (although many will contain apartment buildings). 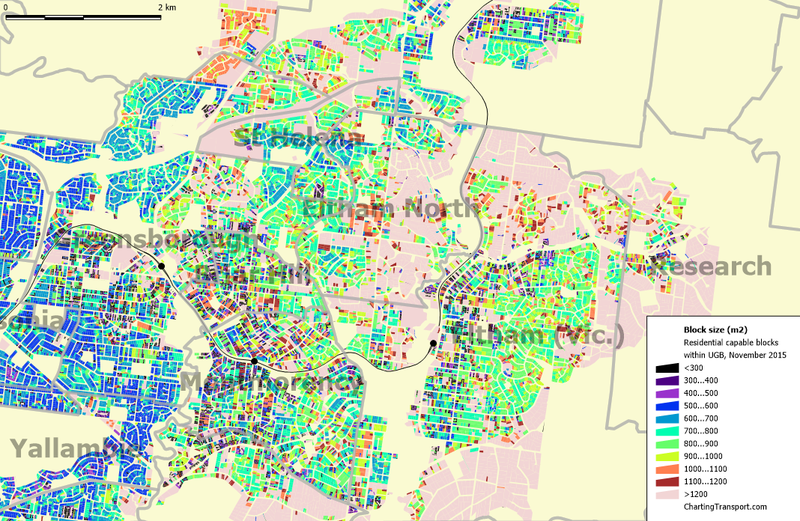 There has been plenty of further subdivision, but there is also a stripe of green that is mostly in tact (a restrictive covenant applied perhaps?). 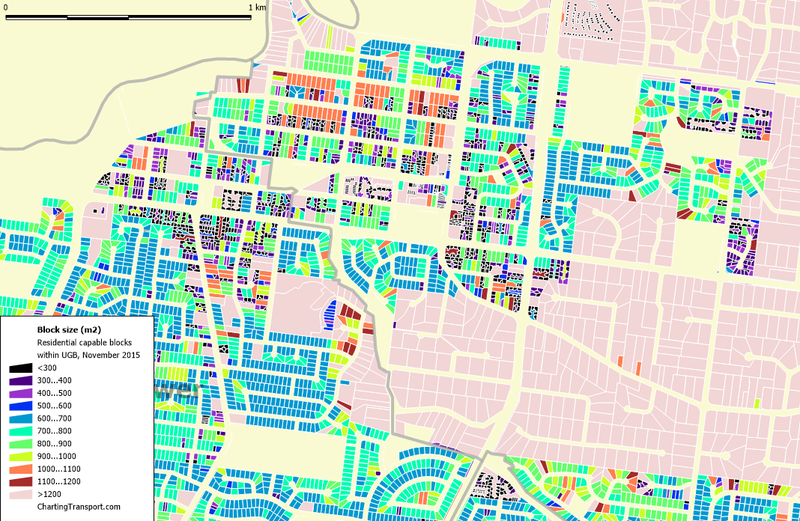 You can also see the recent Valley Lake development in purple in Niddrie. 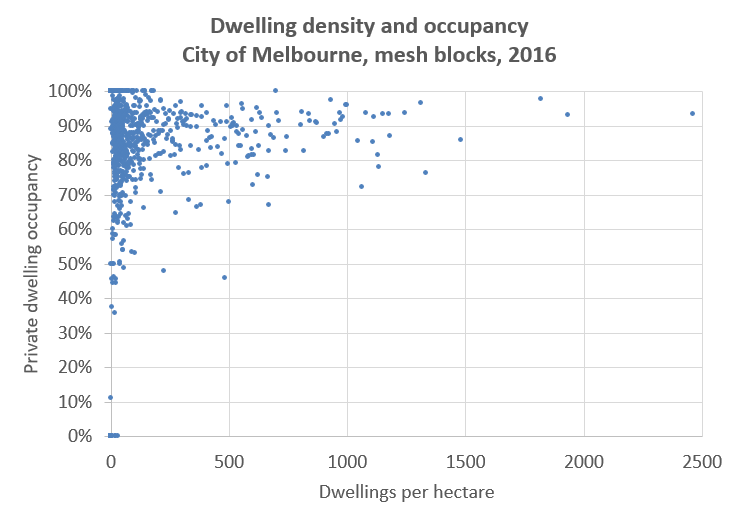 So there is plenty of variation in block sizes across Melbourne, but not that many quarter-acre blocks. 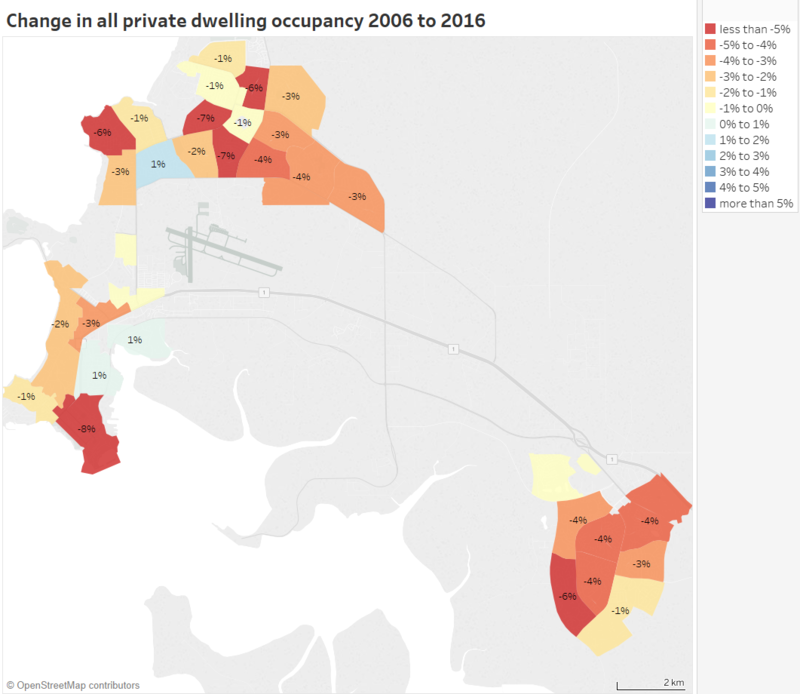 Perhaps we should talk more about the one-seventh-acre block. 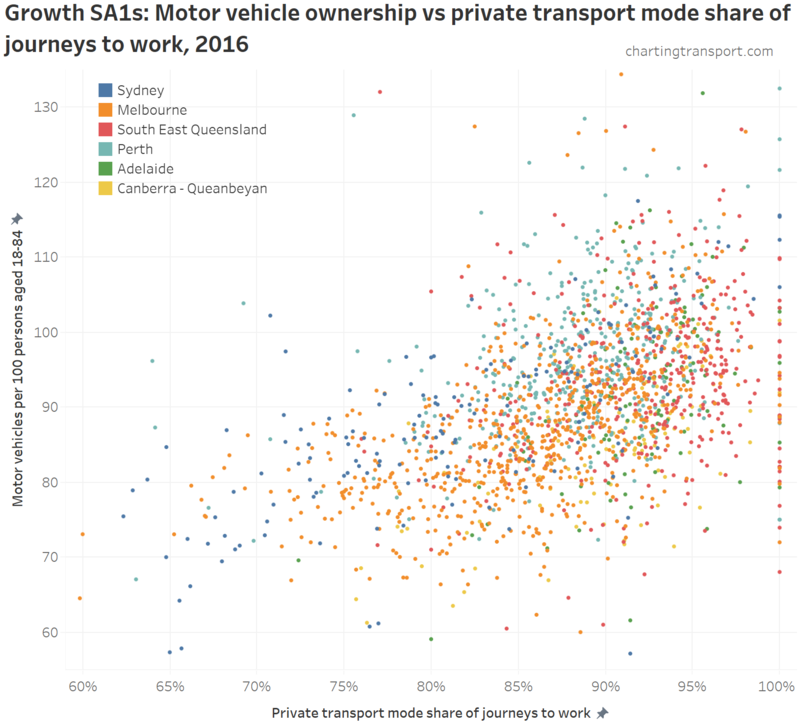 This analysis was made possible with data available from data.vic.gov.au under a creative commons license. 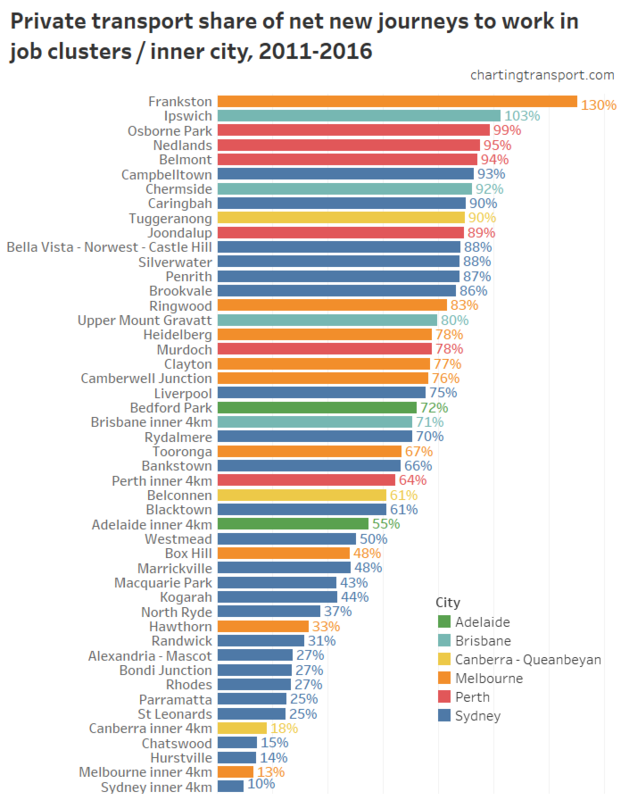 The data is Copyright © The State of Victoria, Department of Environment, Land, Water & Planning 2016. 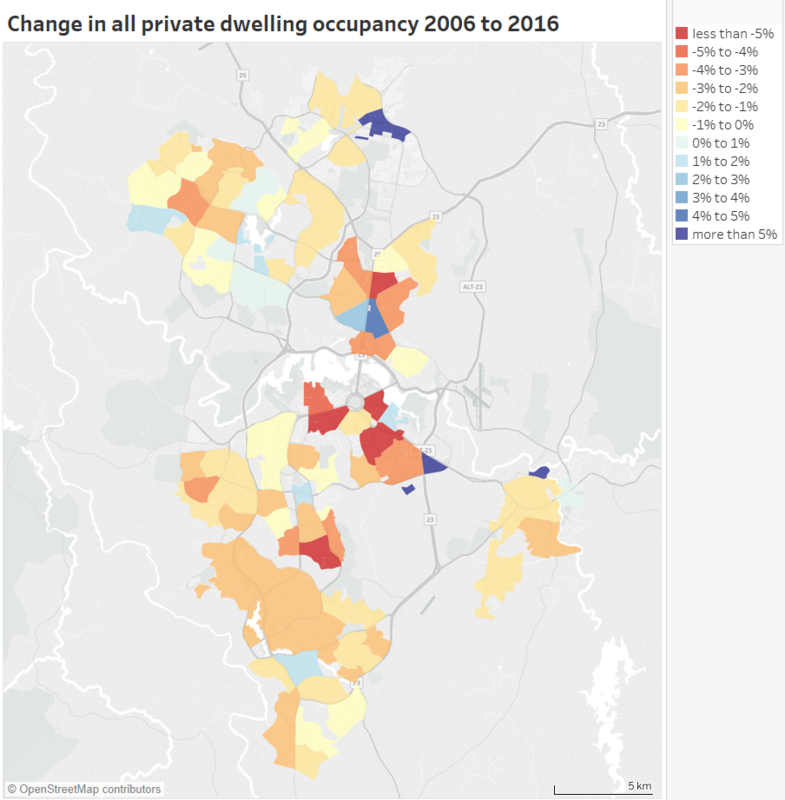 I have used November 2015 property boundary data and May 2016 planning zones (sorry, not quite aligned, but this post has been a while in the making and the differences are unlikely to be significant).